We planned on getting in some skiing on soft, spring snow today, but Mother Nature had different plans and gave us a lot more than that. Temperatures were below freezing at all elevations last night, which is good for running the corn snow cycle, but it meant that surfaces would need some time to soften into what we were seeking. With that in mind, we took care of other projects in the morning and let the sun do its thing to warm up the snow. At around midday I checked on the temperature in the Bolton Valley Village (elevation 2,100’), and it was still reading just 34 F despite being in the low 50s F down at the house (elevation ~500’). Although skies were clear and that late March sun is getting powerful, 34 F at the base meant that summit temperatures were likely below freezing, so if that snow needed softening, it probably wasn’t going to get it. An hour or so later, I checked and found that the Village temperature had only risen to 37 F, but we figured that the lower slopes, especially those at Timberline below the elevation of the Village, would certainly be softening by that point. With Bolton Valley having an extensive amount of west-facing terrain, softening in the morning can be slow, but it really gets rolling in the afternoon sunshine. 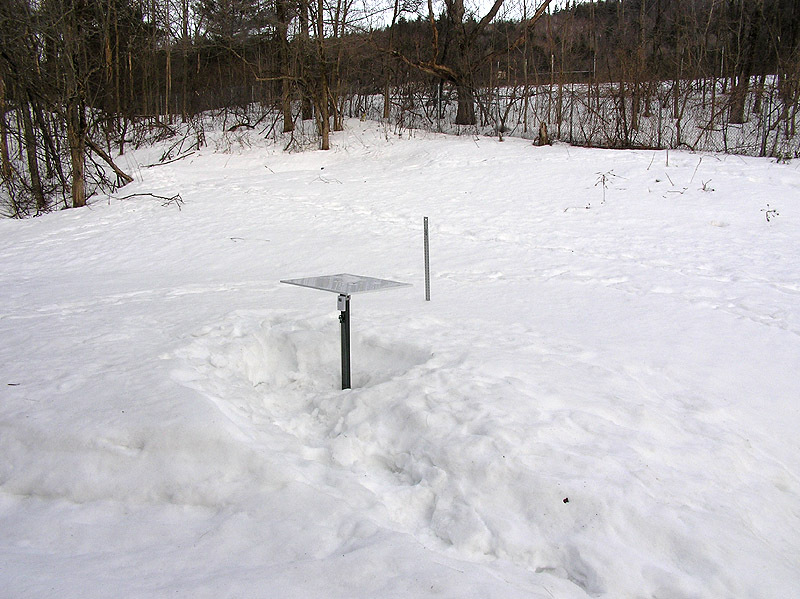 The snowpack has mostly disappeared from the bottom of the Winooski Valley as we approach April, and even on the lower sections of the Bolton Valley Access Road the situation is the same. It’s not until climbing to around 1,000’ that substantial snowpack starts to return, and then it really snaps into place once you get above the big S-curve in the access road and up to the base of Timberline (elevation ~1,500’). We parked there, finding that the temperature was around 40 F, and as we rode the lift we could immediately see that the snow in the Timberline area had nicely softened into corn. I was also impressed with how extensive and complete the snow coverage was on the trails, even all the way down to the Timberline Base. There were a few bare spots around in some of usual sensitive areas, but the natural snow terrain was really in good shape. 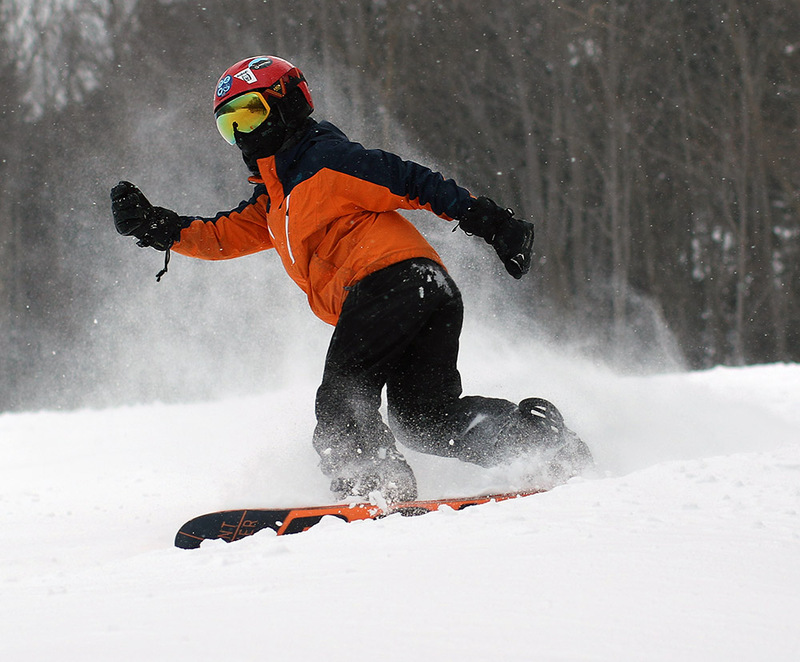 The resort’s Rock and Roll Pond Skimming event, which had been postponed from last Saturday due to the winter-like temperatures, was just finishing up as we boarded the Vista Quad. With the full sun, today was a much better fit for the pond skimming, even if it wasn’t outrageously warm. Riding on Vista we began to see that conditions actually appeared to be wintry on the upper mountain, and indeed that’s what we found as we made a run on Spillway. There was even some powder off to the sides, and I caught some nice turns in there, but for the most part it was standard packed winter snow. It was nice, but nothing that was going to compete with the powder or corn snow. 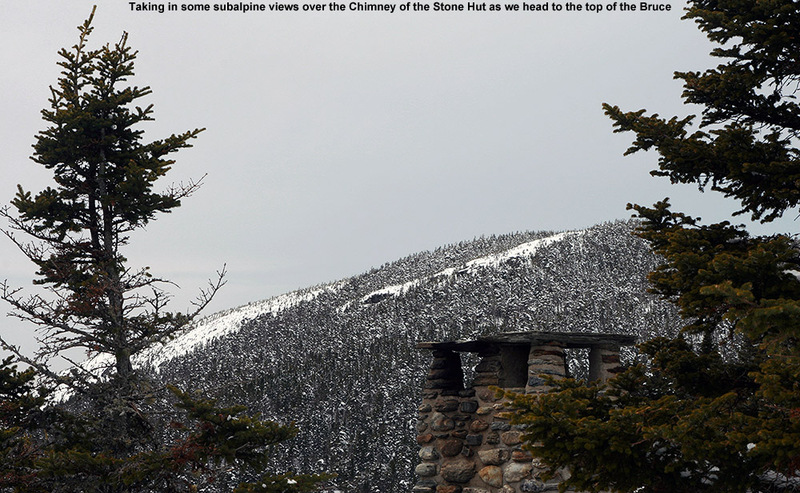 The conditions then transitioned into a mix of winter and spring snow on the lower half of the main mountain, depending on sun exposure and aspect. The plan today had initially been to work on some steep terrain like Spillway and Devil’s Playground in soft spring snow, but with the discovery of some powder on the upper mountain, we decided to visit “The Crack” to see if there was any untracked powder up there. The boys had some fun as we made the ascent, climbing other routes that Dylan pioneered over by the icicles, and starting a snowball fight with me when they had the high ground. We made our way over toward Dylan’s “Heaven” line, which turned out to be more like “Hell”, since the snow wasn’t softened. Indeed the snow remained wintry, but it had taken on a dense layer of about an inch thick from previous elevated temperatures. That line is north-facing, but at around 2,500’ or so, it wasn’t quite high enough to avoid whatever warming had taken place earlier in the week. 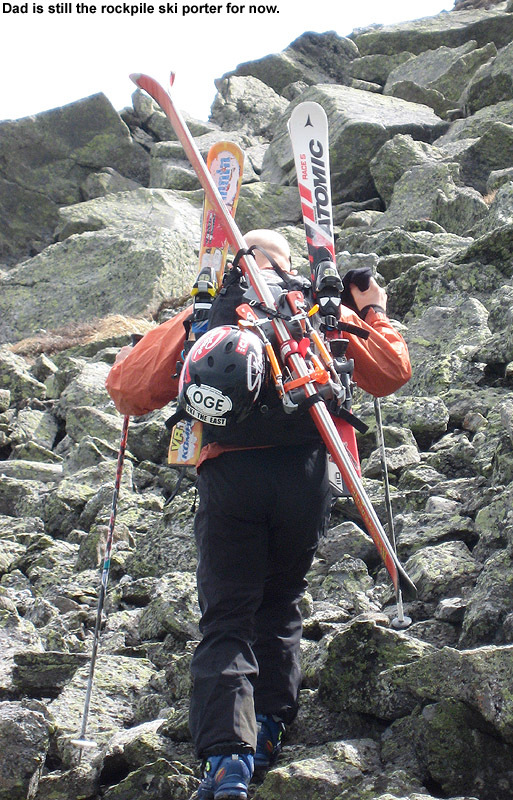 It turned out that someone had already skied Heaven anyway, so we ventured left and changed to a more westerly aspect. Ultimately, we actually found far better turns in the Villager Trees on west-facing terrain that had been softened by the sun today. Since the Timberline area seemed to be low enough in elevation to support soft snow from top to bottom, we finished off the day there, with Spell Binder being our favorite run. We found lots of excellent corn snow from top to bottom, but a few shots were getting sticky if they were in direct sun and hadn’t seen traffic. As good as the snow was down there, I think the boys had just as much fun throwing snowballs around in the sunshine as they did making turns. It was really interesting to find the mountain featuring essentially everything from mid-winter to spring conditions today based on how warm it got in the lower mountain valleys. I’d break it down as the upper mountain from around 3,200’ to 2,500’ featuring winter snow on all aspects except directly south-facing, the lower mountain from ~2,500’ to ~2,000’ featuring a mix of conditions depending on sun exposure, and then most of Timberline featuring spring conditions with its lower elevations down to 1,500’. 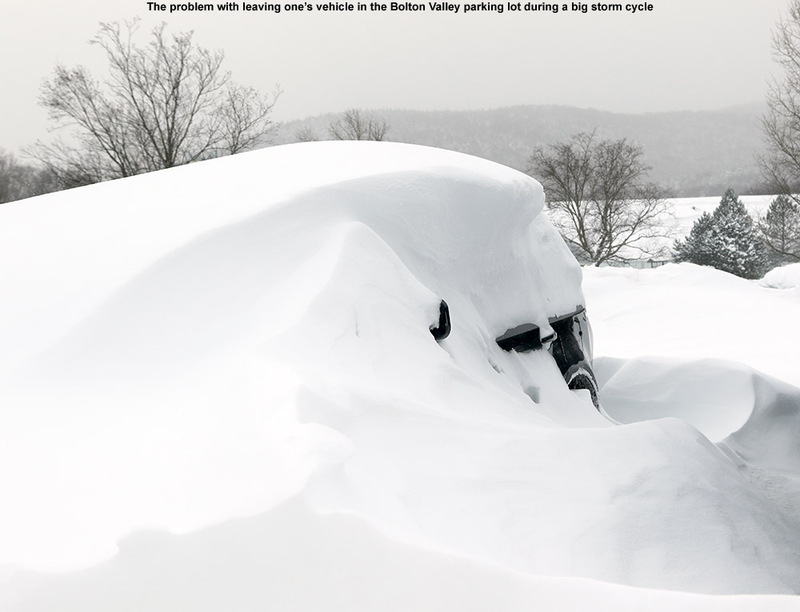 Hopefully we’ll get to do something similar next weekend as Bolton Valley rolls into April. 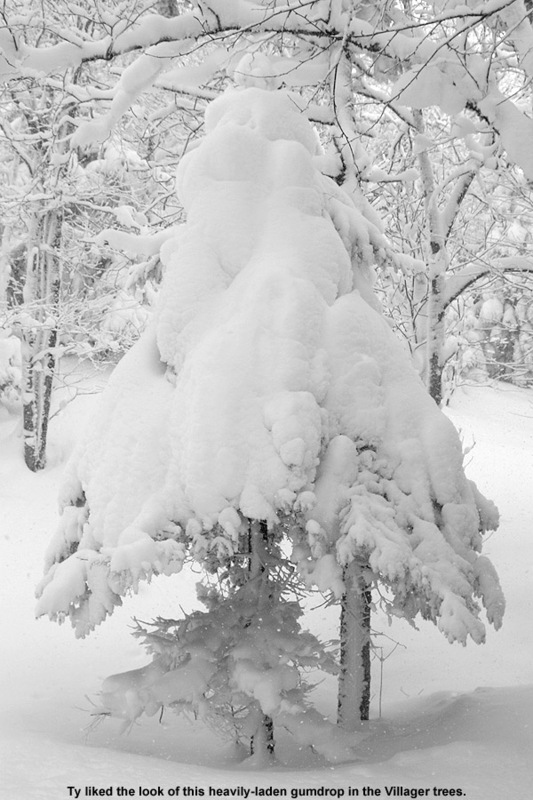 In Northern Vermont we remain under the influence of an area of low pressure stuck over the Maritimes, and it dropped another round of snow overnight. 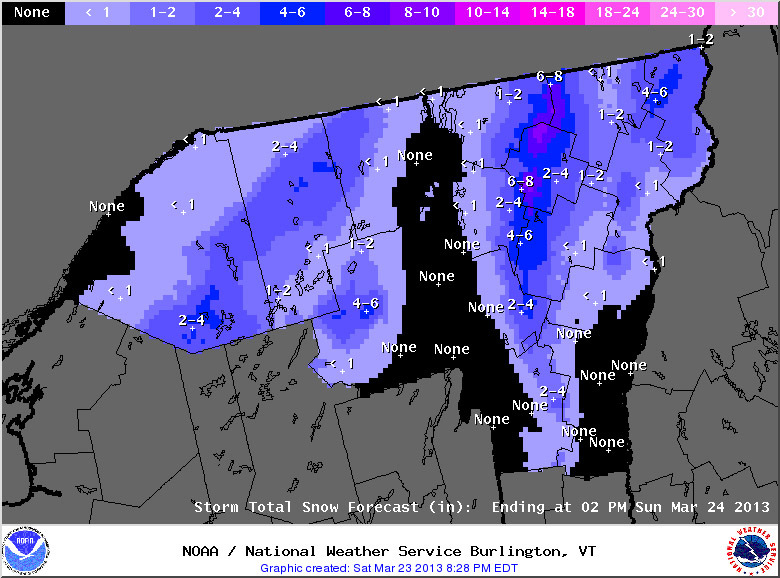 We picked up just shy of 4 inches down here at the house, and Bolton Valley picked up 7-10 inches. 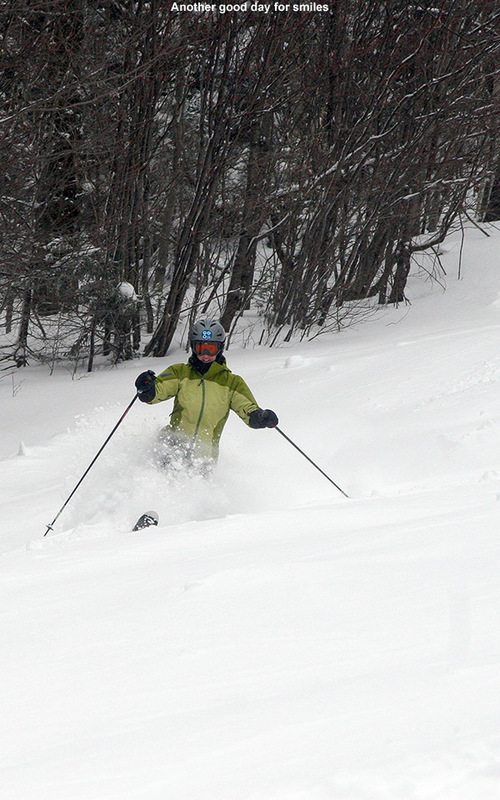 That amount of fresh snow changed my thoughts for today from a more sidecountry or backcountry outing, to a lift-served one. There’s been close to 30 inches of snow on the upper mountain in the past week, and with this latest round from last night I’d expect even the on piste skiing to be great. We arrived at Timberline right around the opening of the Timberline Quad, and kicked things off with a Brandywine to Intro to Spell Binder run. 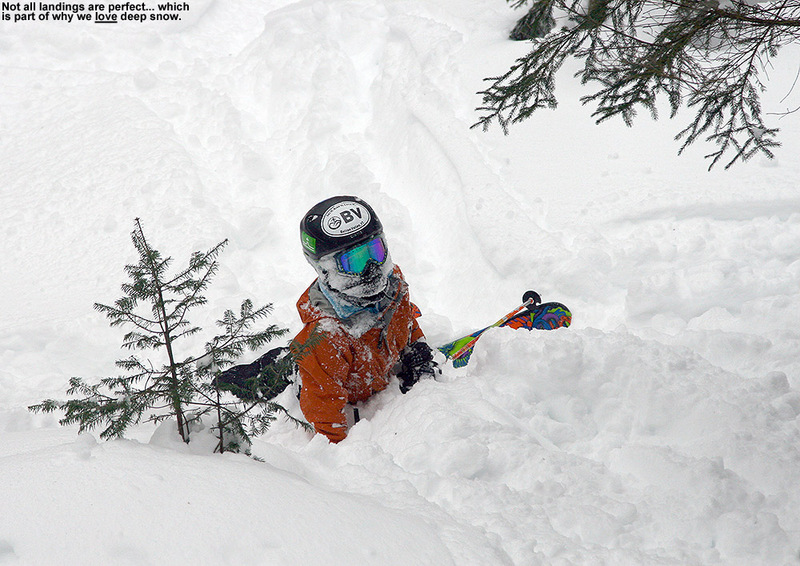 There was some decent powder off to the edges of Brandywine and Intro up top (including enough to bog Dylan down for a great crash that delighted the folks on the lift above), but it was Spell Binder that had the real pay dirt. 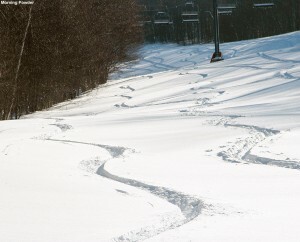 There were a few tracks that had been set down, but other than that it was a sea of untracked snow. I suspect that run would be picked as a favorite in the group today. The snow wasn’t especially deep, but there was plenty of it for bottomless turns and the density worked out pretty well. We went with Adam’s Solitude next, and had the fortune to meet Steve from thesnowway.com. We had an enjoyable run with Steve, and I even managed to sneak in some ski-related conversation. I’ve avoided Adam’s Solitude over the past several weeks, not being really sure that it had the coverage I want to see in there, and based on what I saw today, it really needed this latest storm. 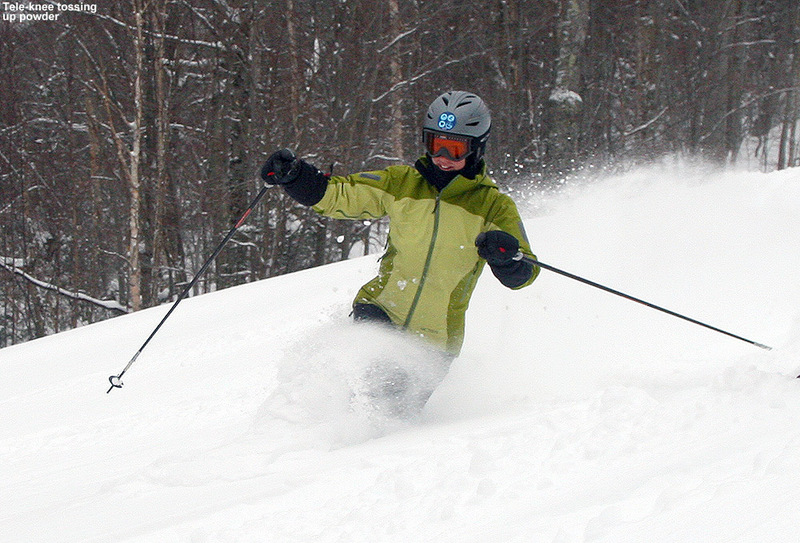 I know that Steve has been visiting a variety of resorts this season, and it’s great that the recent snowfall brought him over to Bolton for some turns. I see that he’s already written up his report from the day, so click on over and check it out. Hopefully Steve can get back for another Bolton trip to check out Wilderness (the Wilderness Chair was down on wind hold today) and some of the backcountry. 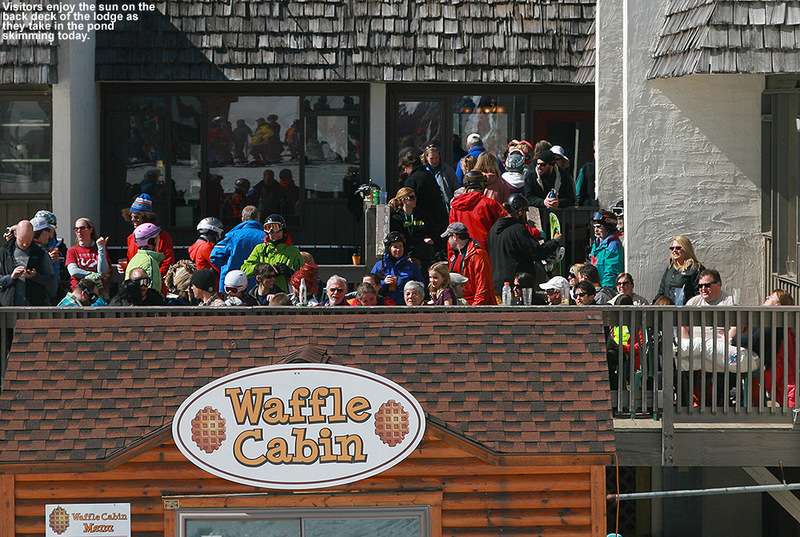 Dylan was really hankering’ a waffle from the Waffle Cabin – in the spirit of what we were calling his hobbit-style “second breakfast”. 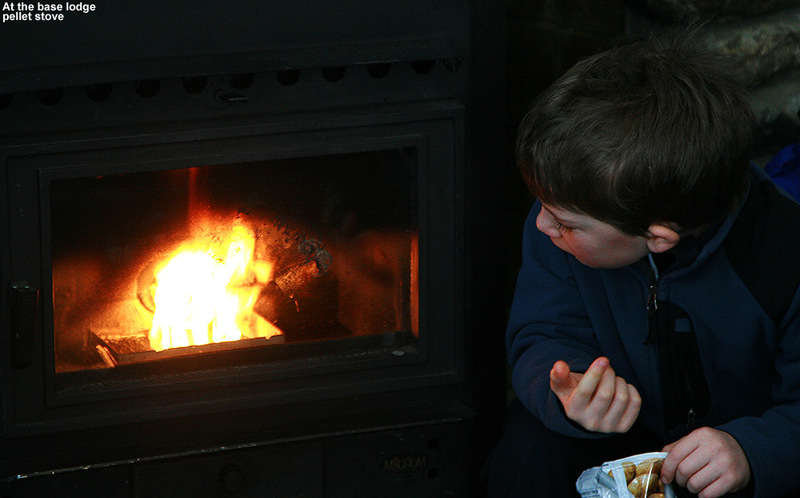 We made our way over only to find that the Waffle Cabin was closed, but we went for an inside snack nonetheless and had a good time sitting by the fire. We made a Vista run after that, and I directed everyone to Devil’s Bowl… or at least close. 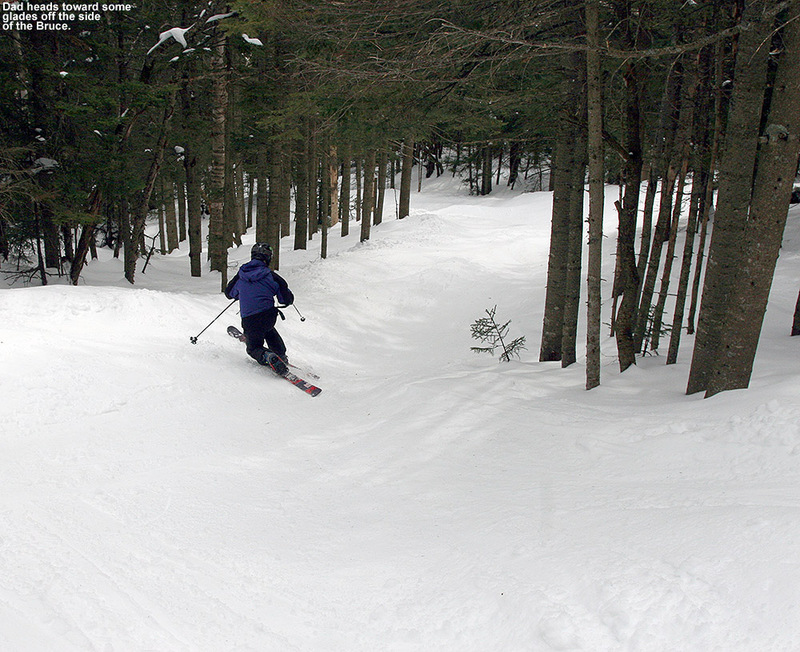 We overshot it a bit and ended up skiing the trees off to skier’s left, but there was a lot of untracked snow in there. Ty called for a return to Timberline, which went over pretty easily with everyone else since the winds, which were definitely howling at the top of Vista, were notably lower down there. We caught the lower part of Tattle Tale on the return, and noticed three guys that were actually skiing Upper Tattle Tale – but the Tattle Tale headwall looked really bony from wind scouring and they were essentially skiing around it on the edges of the trail. 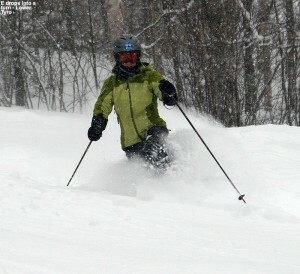 Lower Tattle Tale had some decent powder, but a lot of tracks on it. Fortunately even the previously tracked snow was good, and Ty said he liked it a lot. We decided on one more run before breaking for lunch, which included the Intro Trees followed by a trip through Doug’s Solitude. That run was mostly satisfying Dylan’s request to see a lean-to that E and the boys had built during the summer a couple of seasons ago in the Timberline Mid Station area. 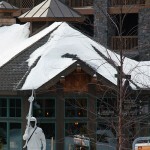 It’s still standing, despite the deep snow. The boys launched some nice airs at the end of those lines though – Ty’s was very smooth with a nice sloped landing, and Dylan’s was flatter with a couple of tiers. We did discover though that the route back to the Solitude traverse needs some definite trimming this off season as it’s got a lot of small vegetation clogging the lines back there. 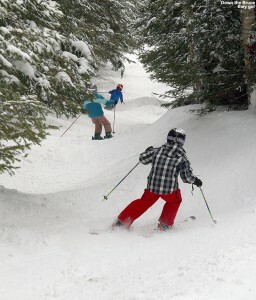 After lunch it was the Wood’s Hole/KP Glades show for the boys. 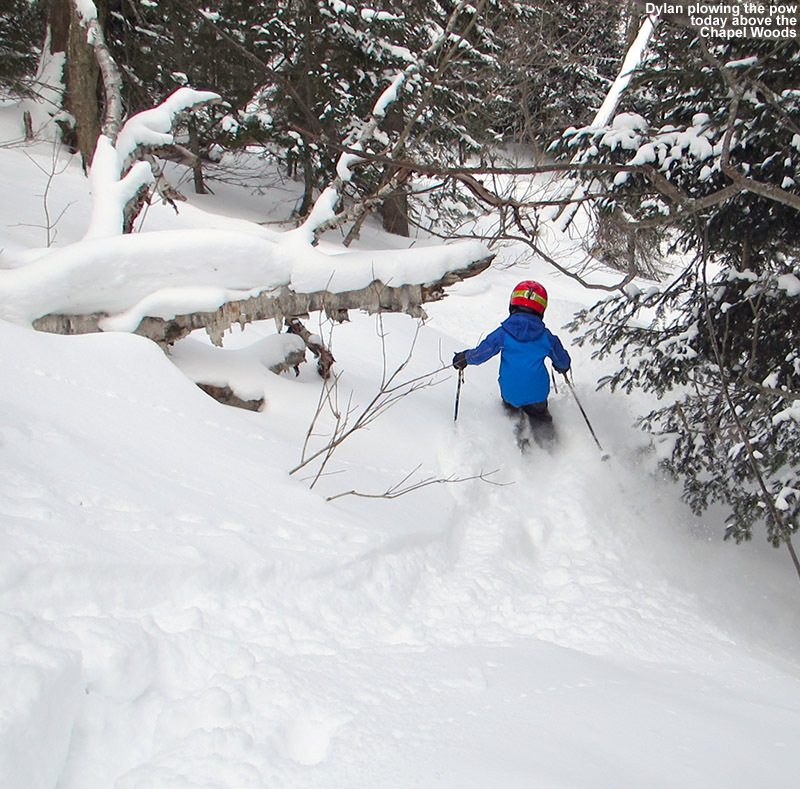 We took the first run with E and she stuck to the trail because her legs were getting a bit cooked for too many more Telemark turns in the steep trees. The boys were looking to drop some cliffs, and drop them they did. They were so excited that we hit two more rounds in there even after Mom called it quits for the day and headed for the lodge. 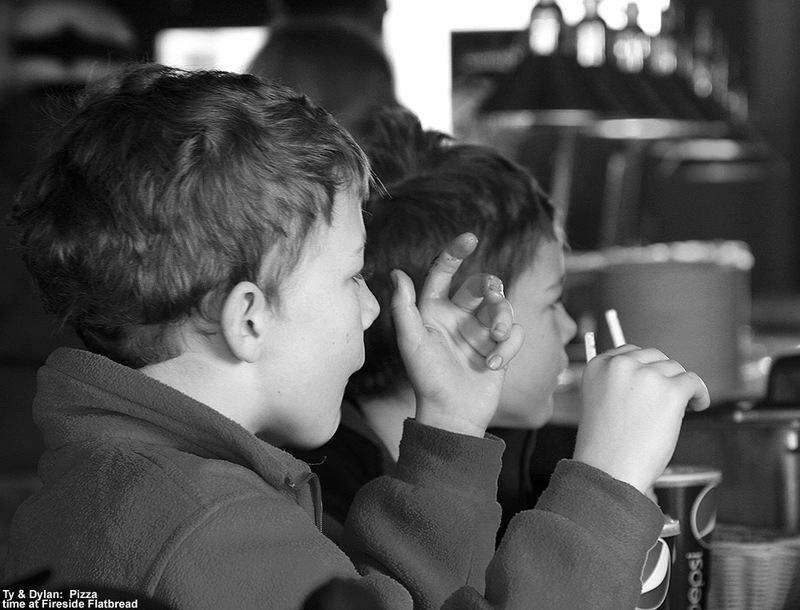 The boys were definitely in the zone during that afternoon session, and the vibe was good because they kept feeding off each other and the whole scene. 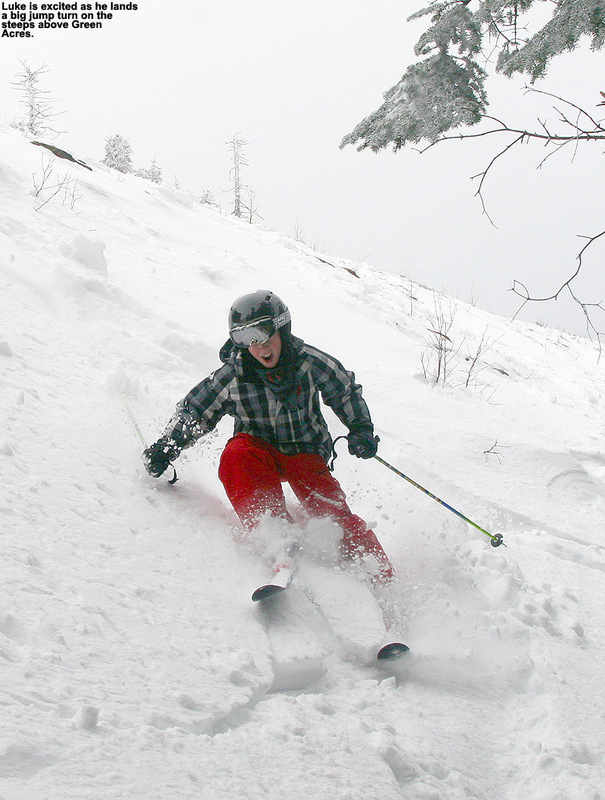 The powder out there was set up well for dropping off the various ledges and cliffs – I checked a number of times and was getting depths of 22 inches where snow hasn’t been disturbed during all these recent rounds of snowfall. Landings were very soft, although Ty did have to walk away from one that I judged just a bit too dangerous with a log and a rock in the landing zone. He was all set to charge it based on what he saw from above, but once he got down and had a look he thanked me for the warning. 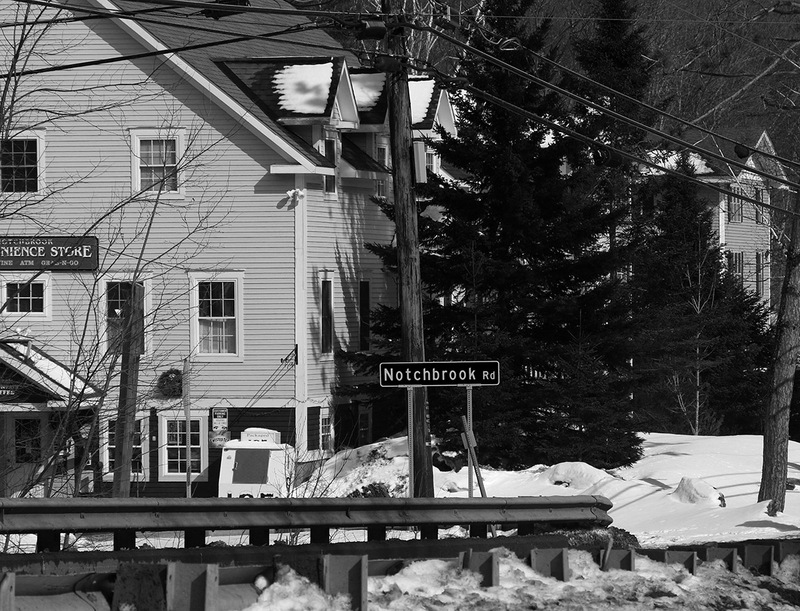 It was a wintry March day today, not especially cold with temperatures in the 20s F, but brisk enough with the wind that the pond skimming had to be postponed. 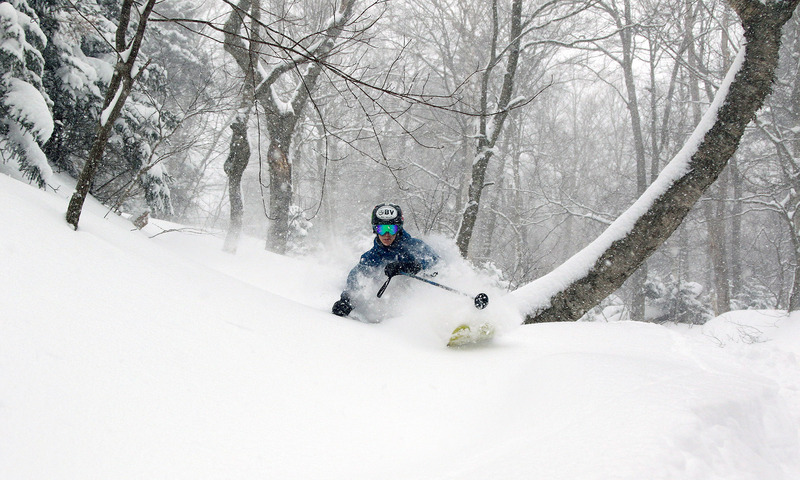 This cold weather is really keeping that powder in great shape however, and we’re not worried because we know that spring weather will come eventually. Until then I say keep the snow flying to make up for the slow January and February. 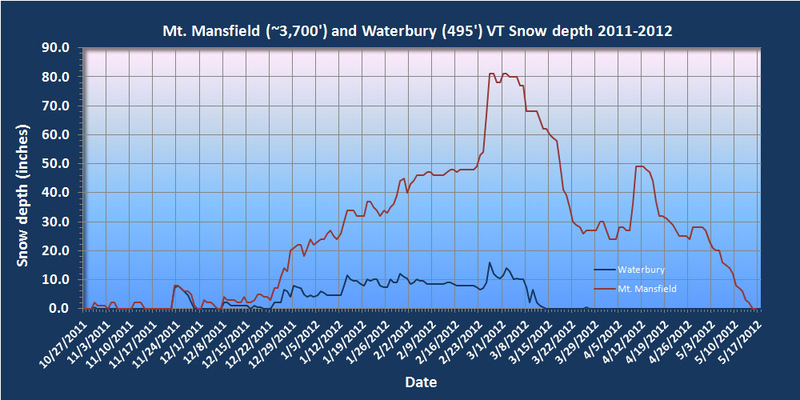 The season is still below average on snowfall (~90% of average at the house), so even though the snowpack at the Mt. 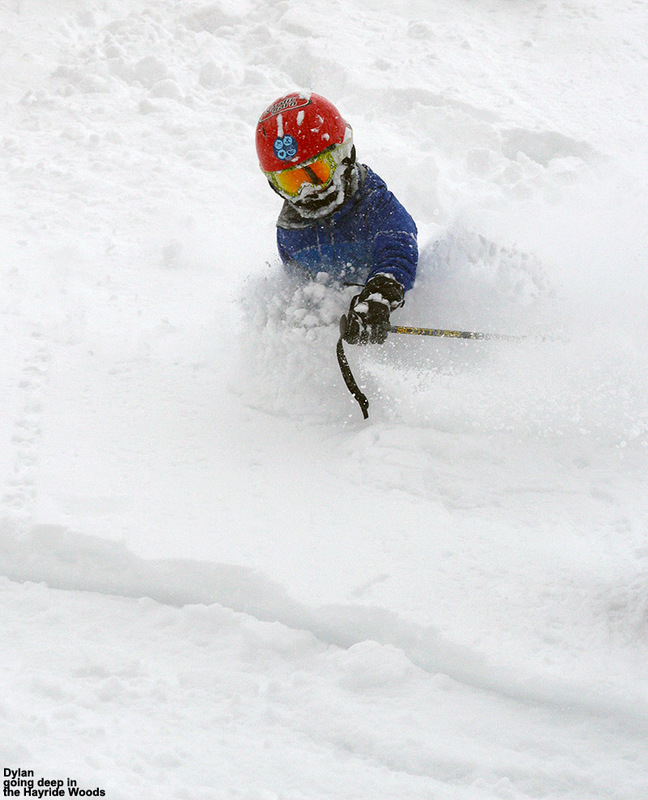 Mansfield Stake sailed above average to 82 inches today, we’ve still got some catching up to do in that department. 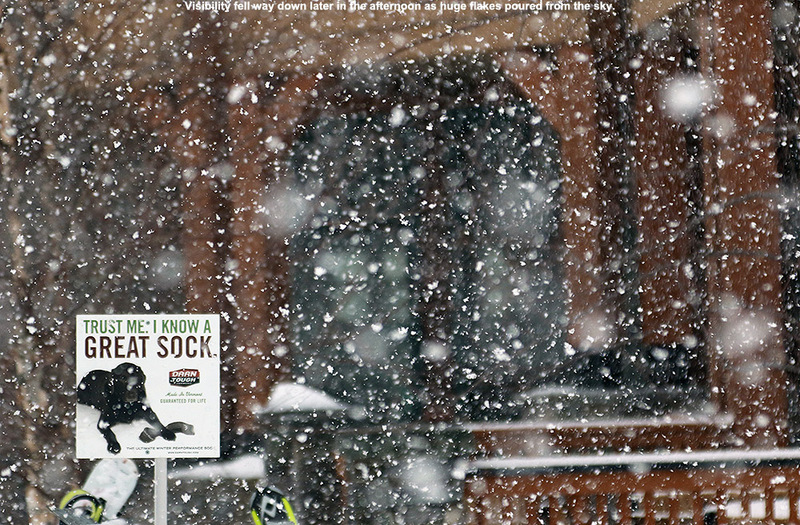 We could actually be in for a repeat of last night’s snow tonight. 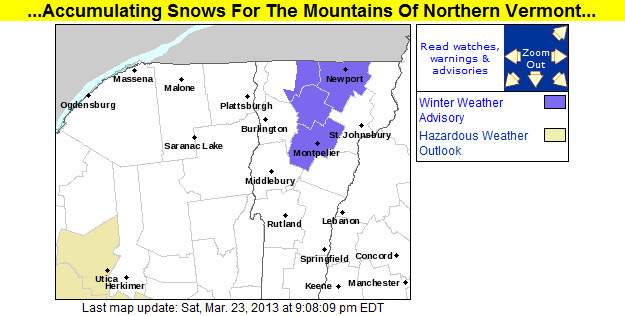 Winter weather advisories up for the Northern Greens for as much as 10 inches of snow, but we’ll have to see how that plays out – so far the radar hasn’t really seemed to light up the way it did last night. 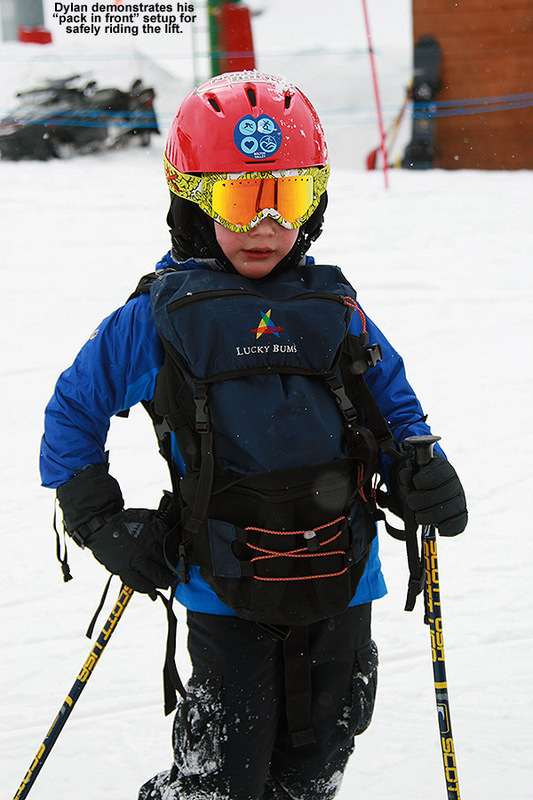 E had been talking about getting another evening of skiing in at Bolton Valley before the season ended, and things came together today to make it happen. 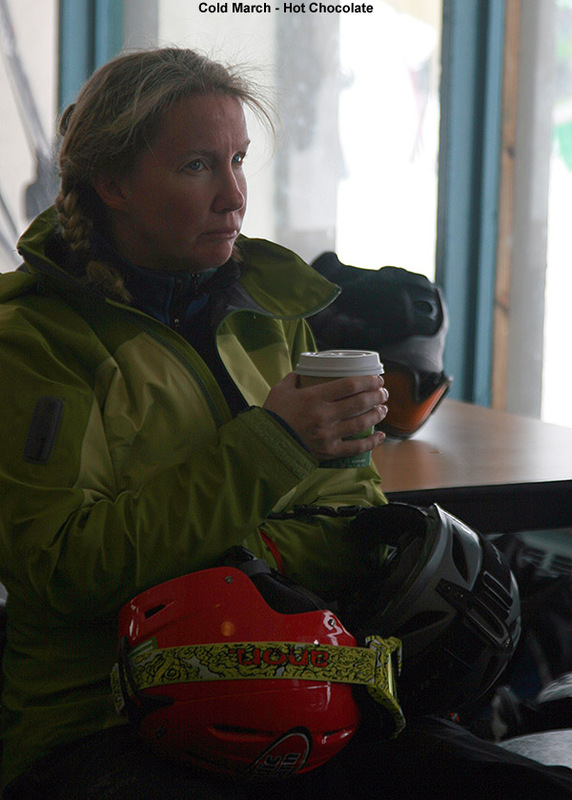 I’d initially forgotten about the potential plans when she called me at work this afternoon, especially since I was somewhat satiated and ready to get a lot of work done after a great morning session at Timberline. Although I did have a lot of work that I wanted to get done in the evening, she said that the boys were interested in going up for some skiing as well. It was hard not to jump at the opportunity if they were eager for some turns – an evening out on the slopes would probably be better for everyone than an evening of TV or similar indoor things. 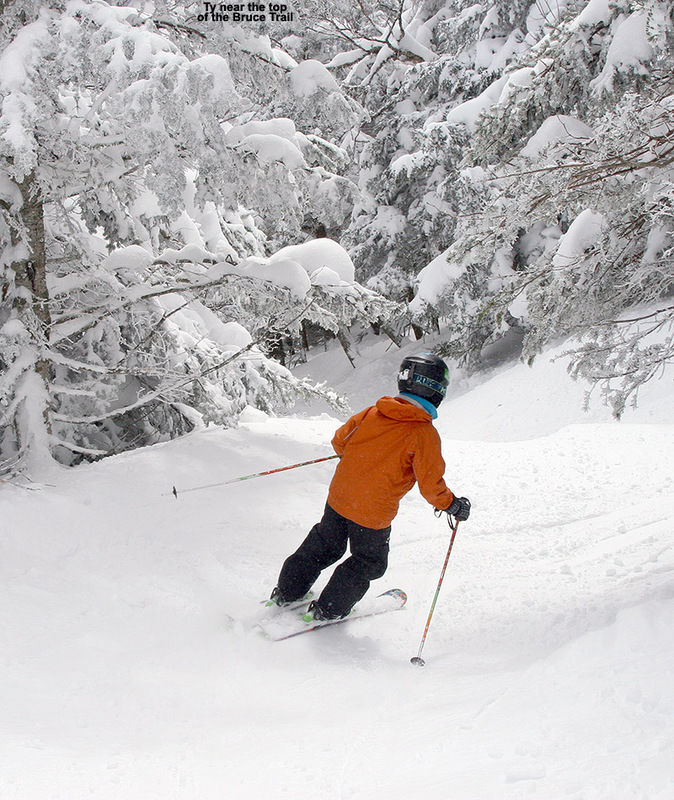 Even if there isn’t an ongoing hefty storm to really sweeten the deal, conditions are pretty darned good after the recent snows, and temperatures haven’t been too bad either. As we chatted on the phone, I began to describe the fantastic turns that I’d had this morning, lamenting the fact that they weren’t there to experience the powder. But, as we began to plan the evening, I suddenly realized that they actually could get out on that same snow. 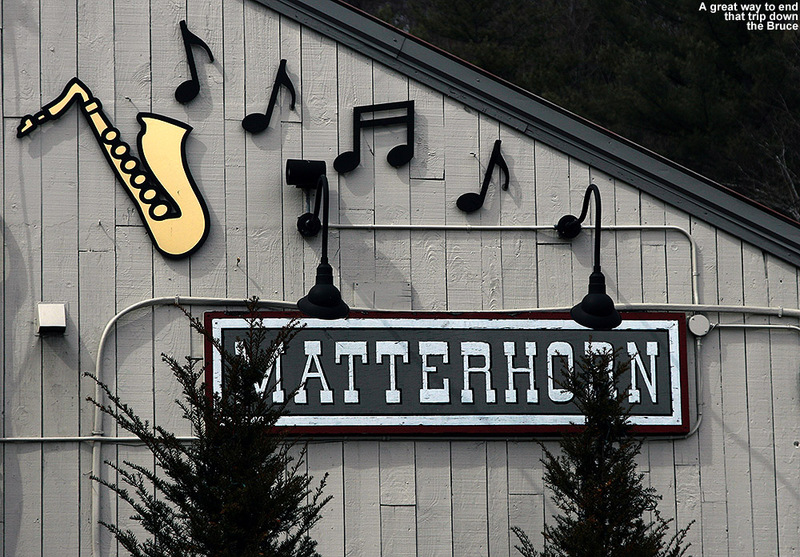 We’re into daylight savings time and past the spring equinox now, and there’s light in the sky until 7:00 P.M. The evening plans began to shift, and pretty soon we were discussing the logistics of an evening Timberline run. 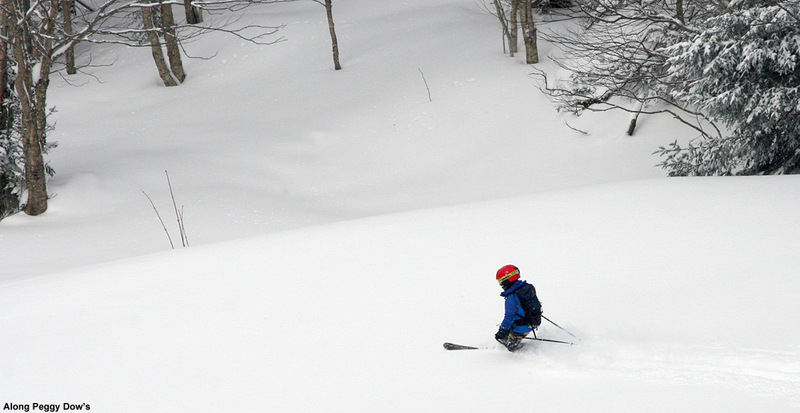 I initially thought that we should just skin up like I’d done in the morning, until E pointed out that it could be done much more quickly if we used the lifts and made it a sidecountry run. That was brilliant of course, because it would be much faster for the boys than trying to do a full ascent under their own power. Even with the relatively late sunset, time was still going to be of the essence, so we quickly decided on how to optimize our schedule. E and the boys were at the house, just a few minutes from the resort, but I was farther away in Burlington. Conveniently though, I still had all my gear right in the car from my morning outing; I could get into my ski clothes on the way to the mountain, and easily be there by 6:00 P.M. ready to go. 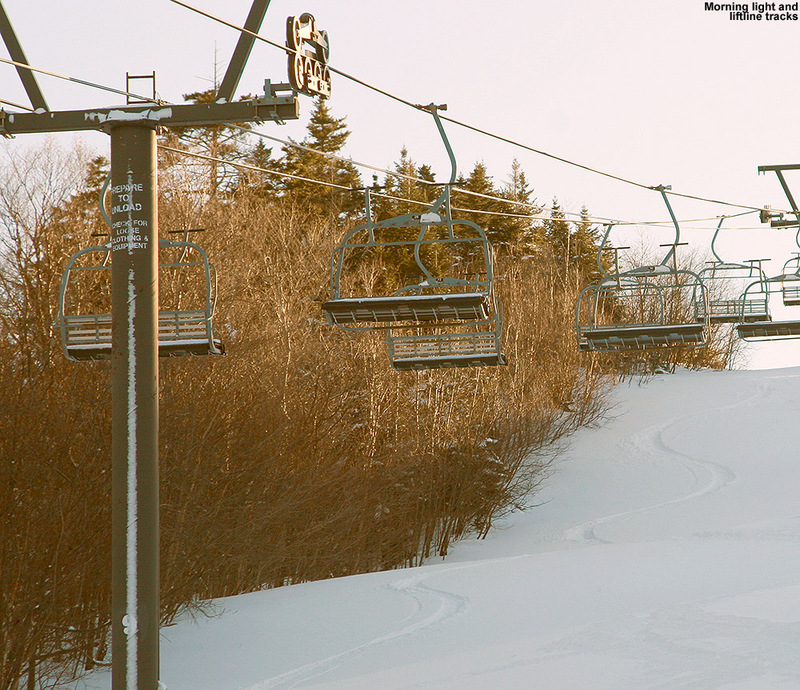 That would give us a good hour of light, which would be plenty of time for a lift-assisted lap on Timberline. 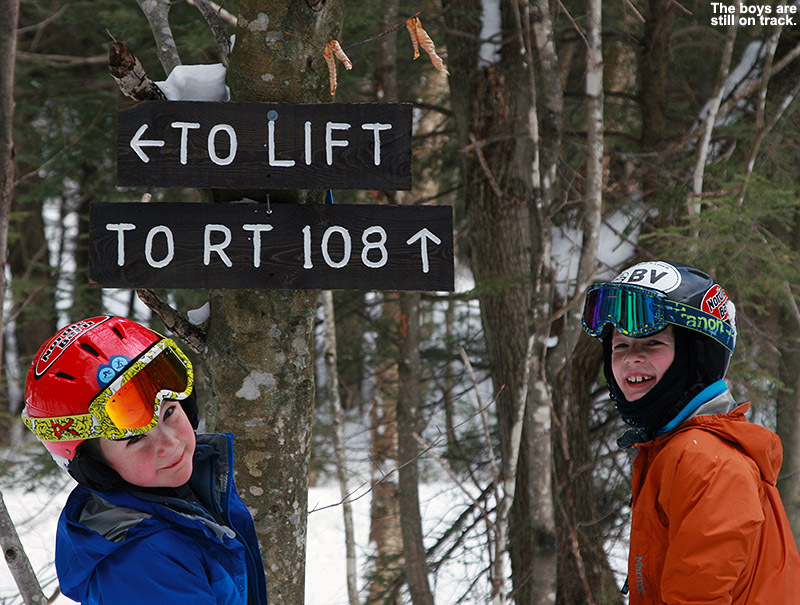 I made good time traveling from Burlington, and arrived in the Timberline lot a few minutes before 6:00 P.M. That gave me enough time to park my car, get into my ski boots and outer layers, and have all my gear ready to go by the time E and the boys arrived. They picked me up and we headed up to the Village. There were no concerns about leaving a pair of “driving boots” in the car (one of those logistical aspects that has almost caught us in the past) because I was already in my Telemark boots and I had two other pairs of boots/shoes in the car. We were good to go. E dropped me and the boys and all the gear off right at the base of the Snowflake Lift, and we got everything ready while she parked the car and got suited up herself. It was fun to be on that end of the preparation duties, since I’m typically the one parking the car. Within a few minutes we were on the Snowflake Lift heading upward, with the sun still well above the horizon. Even without lights, the resort still had all the trails of the Snowflake area open because of the extended daylight, so we easily made it over toward Five Corners and up to the Timberline Summit. Everything had gone smoothly on our part, but there were still a couple of potentially confounding factors with regard to the skiing: 1) since the resort is planning to resume Timberline lift service tomorrow, they had been grooming some of the terrain, and 2) even with relatively cold temperatures, it appeared that sun exposed areas on the western slopes had melted a bit due to the strong March sun, and that left a sun crust that we’d want to avoid if at all possible to get the very best powder turns. 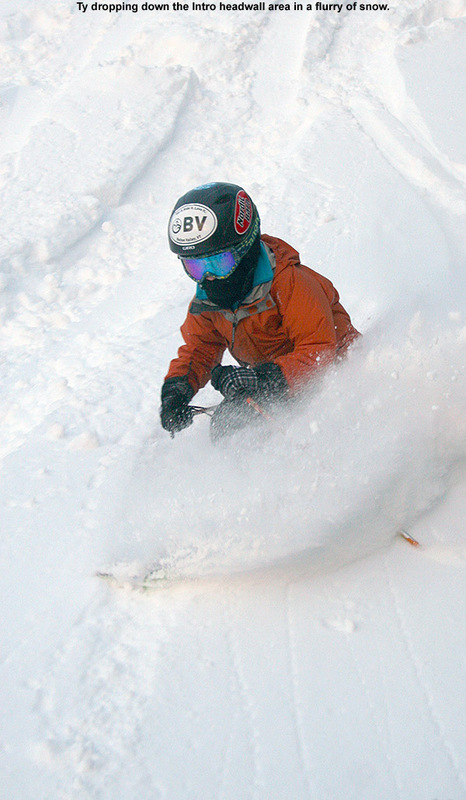 The upper part of Brandywine had been groomed pretty thoroughly, so that only left a few options for powder skiing. 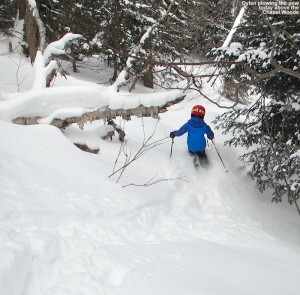 As I expected, we found that the shaded, skier’s left of the trail yielded the best snow – in most cases one could get powder that was just as pristine as what I’d found in the morning. With some grooming having been done on both Showtime and Twice as Nice, Spell Binder gave the most available powder below the top section of terrain, and we made our way there. Just like I’d experienced on Showtime in the morning, the Spell Binder Headwall was in decent shape aside from a little scouring at the very top – I’d say we have the easterly wind to thank for that. As long as one stayed along that skier’s left, and fortunately there was plenty of untracked snow there, they were catching some very good powder. Dylan, E and I focused our efforts on that area, while Ty, who had decided to go with his fat alpine skis, seemed to have no problem ripping up any part of the trail, regardless of whether it had seen the sun or not. He was simply flying down the slope at times – at one point he said he was going so fast that he wasn’t even leaving a track. I think a little sun crust might have been involved in that one, but he really did seem to be a kinetic blur most of the time off to our right, and he does seem to have elf-like abilities at time atop the snow. 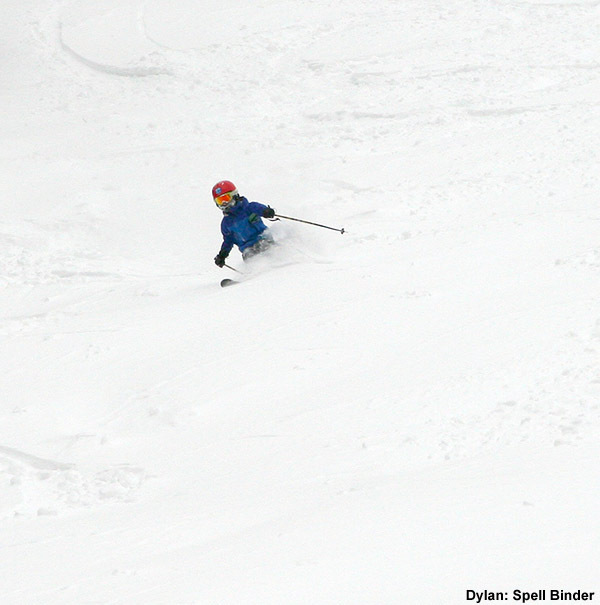 Dylan had daringly chosen to go with his Telemark skis, and certainly struggled at times, but he also made some really nice turns. E was initially disheartened with the performance of her fat skis on some of the packed terrain we’d hit on the way down, but they sure seemed to work well for her when she was in the powder – as they should. 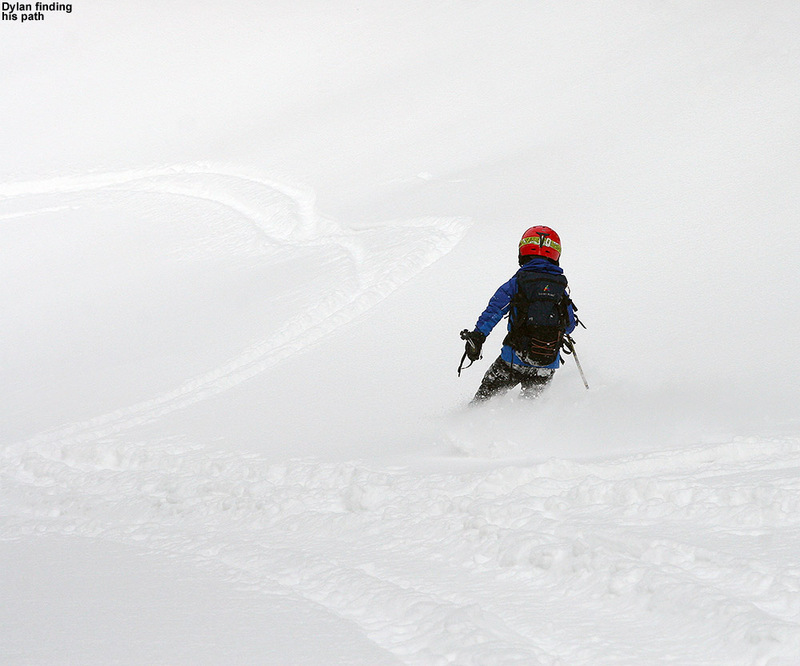 I had no complaints, my AMPerages did heir amazing job in the powder, and even when I strayed a bit far toward the crust, they seemed to help me get on track with plenty of crust-busting power. Like this morning, it was the kind of snow that made you just want to keep going and going with turn after turn, and apparently that’s what I did. E thought I might stop at one point as we were farther down the trail to pass the camera off to her for some pictures, but she was surprised to see me just cruise right on by. In reality though, pictures were getting tough as time wore on – the sun was going down and the light was getting quite dim. Low light is the enemy of high speed photography, and we were pushing it even with using the DSLR. 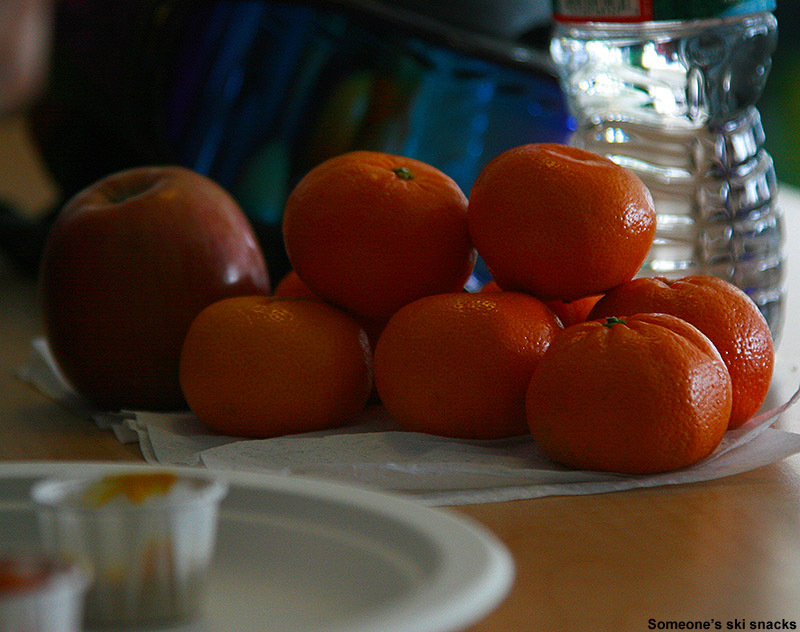 We still got some decent shots out of the session, even if I had to crank up the ISO to somewhat grainy levels. We definitely made the most of the light we had. It was kind of neat the way things came together this evening to let us get in that late-day sidecountry run, and we’ll definitely have to keep these sorts of spring days in mind for future. 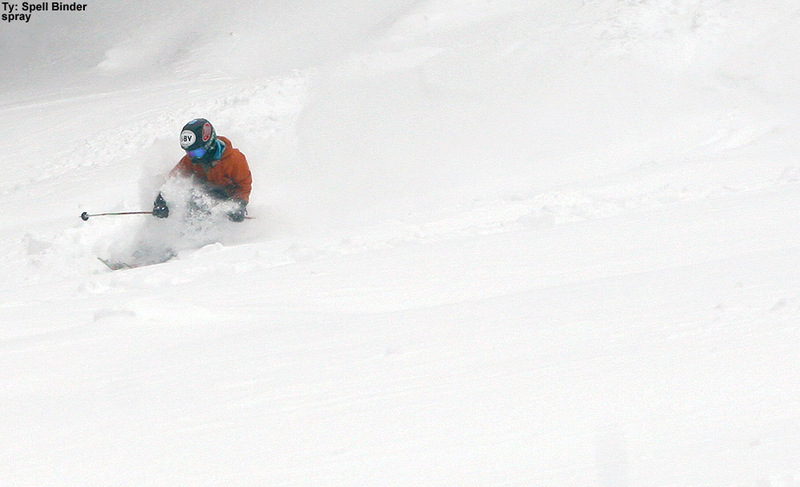 We’ve got more snow coming in over the next couple of days, with more fluff to top off what’s currently out there. I think it’s going to be a fun experience as we balance out the new snow with which aspects and elevations have seen that bit of sun crust, but I’m sure there will be some great turns out there this weekend. 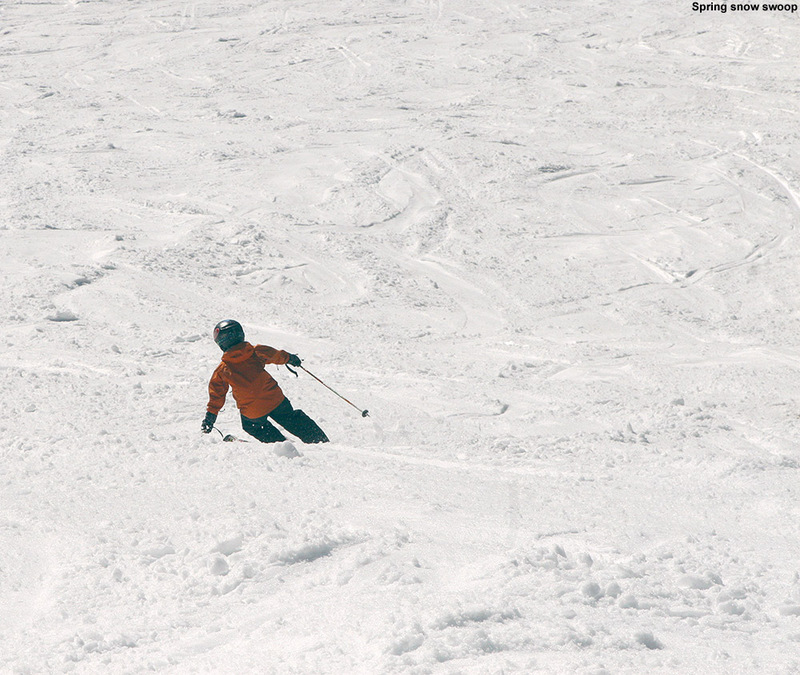 Today felt like a blast from the past… well at least the somewhat recent past of the 2012-2013 ski season. 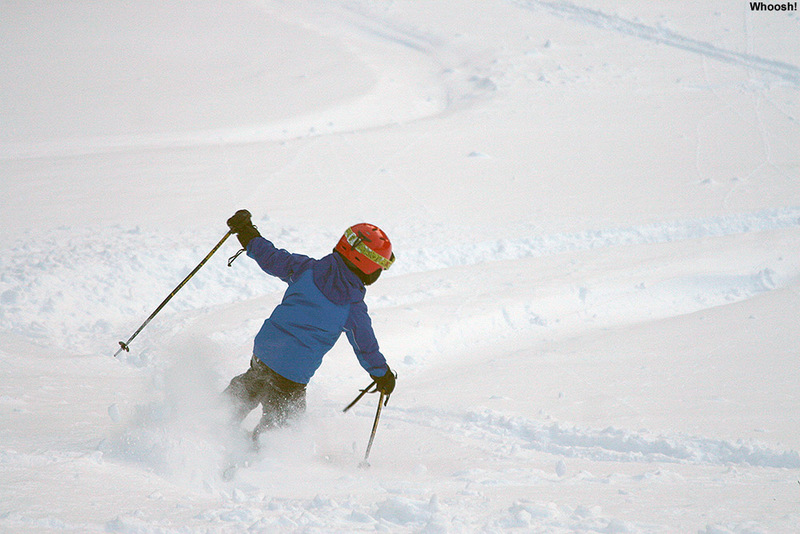 With a silent Timberline Quad, luxurious untracked powder on the slopes, and fat skis on the feet, it was just like being back in December. 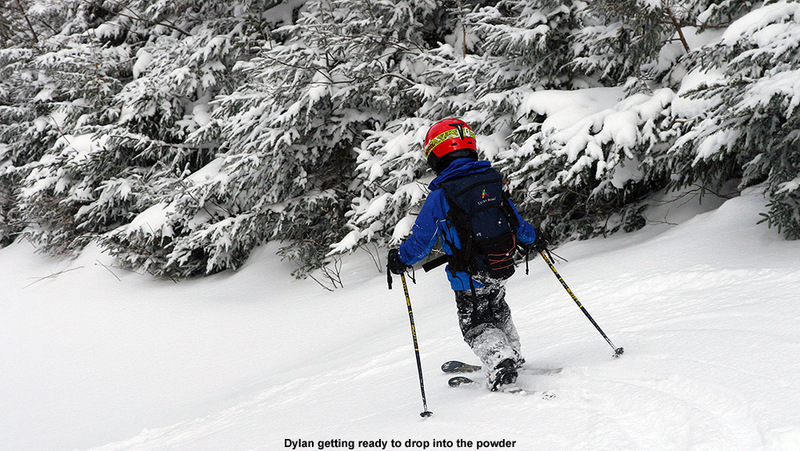 That second half of December was one of the best stretches for ski conditions this season, and it was the early date combined with some mechanical issues on the Timberline Quad that left the Timberline area the realm of those earning their powder turns. 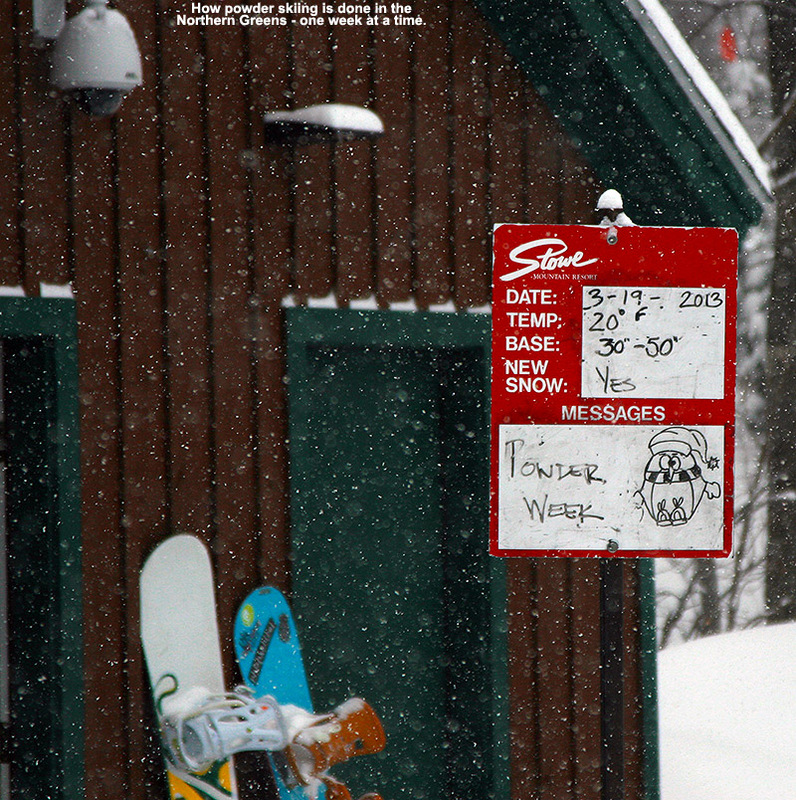 Now we’re on the other end of season, and as it begins to wind down we find that the Timberline Quad isn’t running every day. So it’s back to earning Timberline turns, but with a more established base of snow, and a lot more sunshine. At some point earlier this week I realized that the Timberline Quad wasn’t running, so with some extra time this morning, I made my way up to Timberline in search of powder. Our storm earlier in the week produced a nice resurfacing dump with about a foot of synoptic density snow, and it’s been followed up over the past couple of days by some dry fluff to really top that off for some primo powder skiing conditions. Skies were clear this morning, with temperatures in the mid teens as I pulled into the Timberline lot, and the sun was just trying to break the ridge that marks the top of the resort to the east. There were a couple cars in the parking lot and I could see tracks on the trails indicating that people had certainly been out taking advantage of the snow. Depth checks at the Timberline Base elevations revealed anywhere from 12 to 15 inches of powder above the subsurface, although I tended to get reading in the 10 to 12-inch range higher up where the wind may have pushed the snow around at some point. The main skin track today was up Showtime, and it took a somewhat unconventional route right up the gut of the trail because it was made in someone’s descent track. It was quite a good track though, well packed and devoid of any footprints. 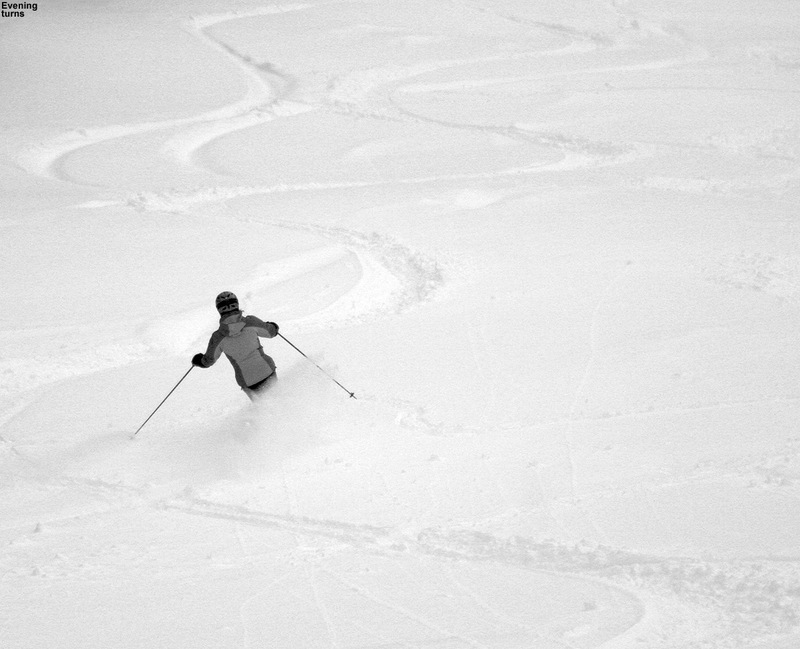 I saw about a dozen tracks from other skiers that had descended in the Showtime area, but untracked lines were still quite plentiful. All was quiet when I arrived at the Timberline Mid Station, although I eventually saw a couple of snowboarders and skier getting on with their descents. One of the lift operators showed up and began to prep the mid station area for use, and when I asked him about the upcoming schedule for Timberline, he said that it was opening back up tomorrow. 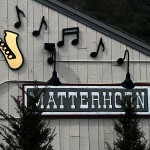 That is of course a bittersweet occurrence – it means that we can get lots of Timberline runs, but gone are the runs of endless powder day after day. I figured that at least I’d made it in time to catch “Club Timberline” mode. I poked around over at Spell Binder, and it looked good, but I ultimately chose Showtime for the descent because that seems to be a bit harder to come by. Another aspect of the day that reminded me of December was the fact that all the west-facing headwalls appeared to be filled in nicely, without the usual scouring that can accompany a westerly wind – there must have been some easterly component to the wind during our most recent nor’easter. The Showtime Headwall looked like it had been treated nicely by the storm, so I dropped in with the confidence that I wasn’t going to hit anything below the snow. 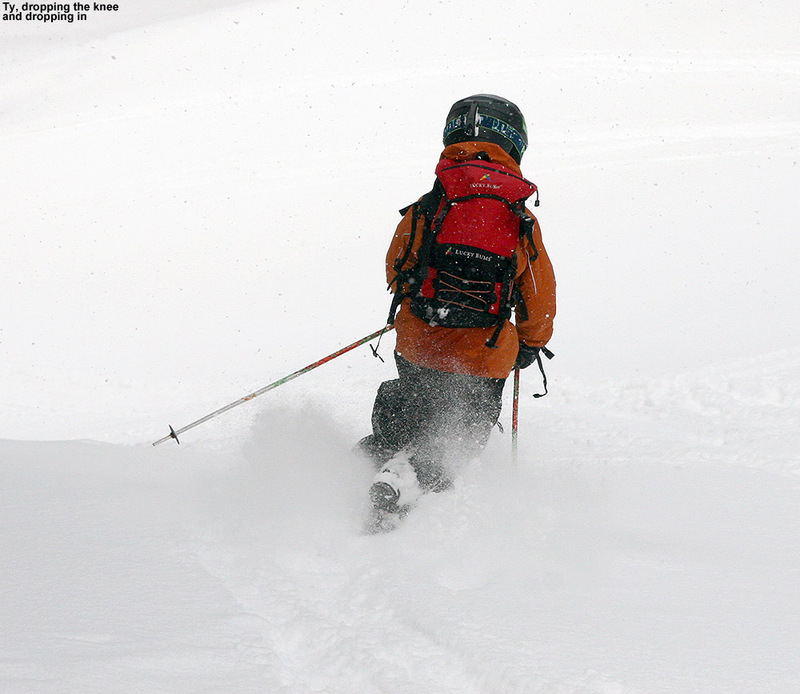 I pushed hard into those steep turns on the headwall, and the powder pushed right back, cushioning each movement of my skis with a snowpack of ever increasing density. 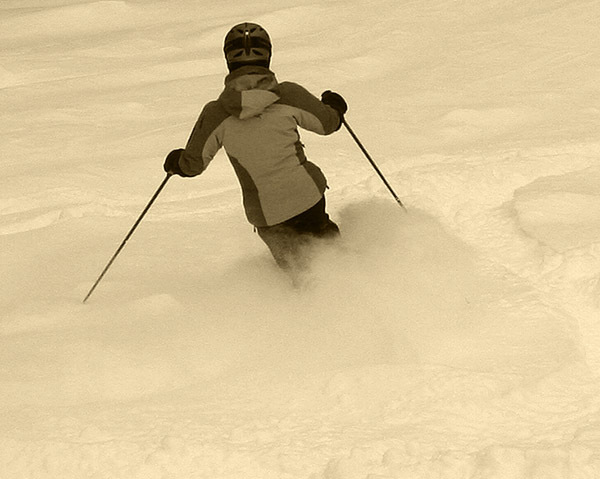 The turns were so silky smooth and buoyant that I have to give the conditions at least a 9 out of 10. It really was utter perfection in terms of snow quality; with the only thing one could ask being perhaps some deeper champagne and a bunch of face shots. After one quick stop I rattled off turns down the rest of the run, with a cadence that lingered in my head long after I was done. 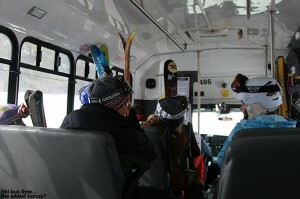 The temperatures are staying cold, the powder is staying dry, and we were off to Stowe this afternoon to check it out. 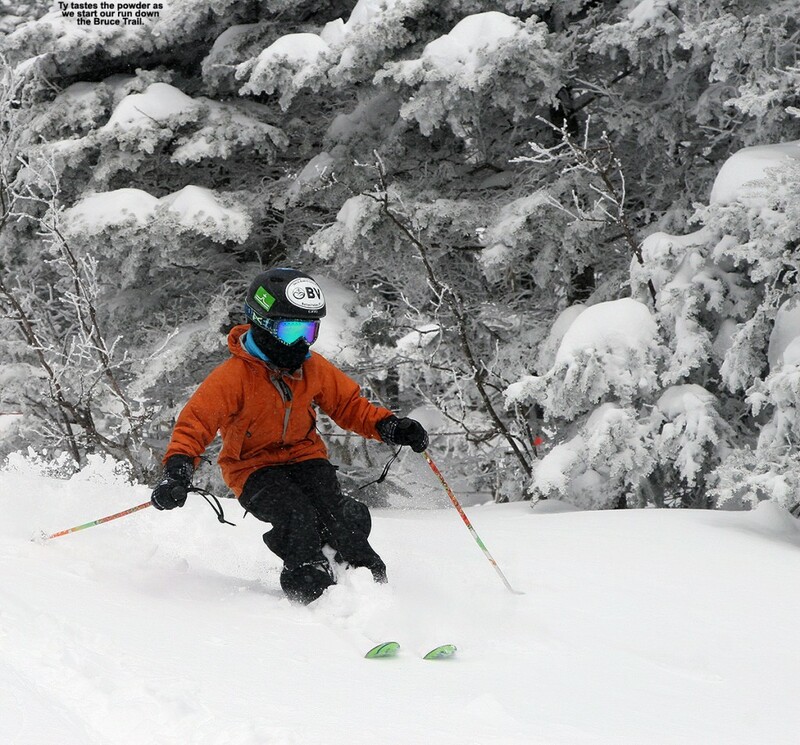 Stowe reported similar snowfall numbers to Bolton Valley for the past couple of storms, and based on what we experienced yesterday, I knew that there was going to be some great powder skiing out there on parts of the mountain. The current conditions are just excellent for powder skiing on moderate angle terrain; the warmth from earlier in the week set up a smoothed subsurface to support the new snow that fell later in the week. 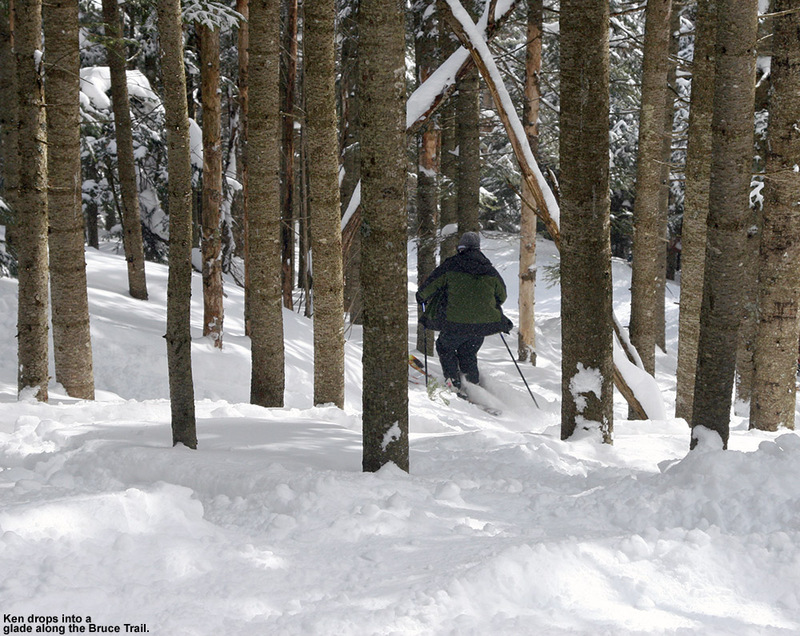 As I tossed around ideas of where to bring our BJAMS ski group today, I eventually realized that the Chapel Glades and the other woods surrounding that area were going to be just what we needed. I haven’t brought any of the kids there that I can remember, nor had I been there much myself in the past few seasons, but it looked like it was time to change that. Peering out from the car as we arrived at the mountain, it looked cold and windy at the Spruce Peak Base Area, and indeed it was. It wasn’t January cold, but it was on the cold side for March, with midday temperatures around 20 F and plenty of wind to add some extra bite. While we waited for the entire group to assemble, we did a quick run off the Alpine Double Chair, and as a prelude to the day, I brought Ty, Dylan, Luke, and Jack into some of the Upper Meadows Trees. 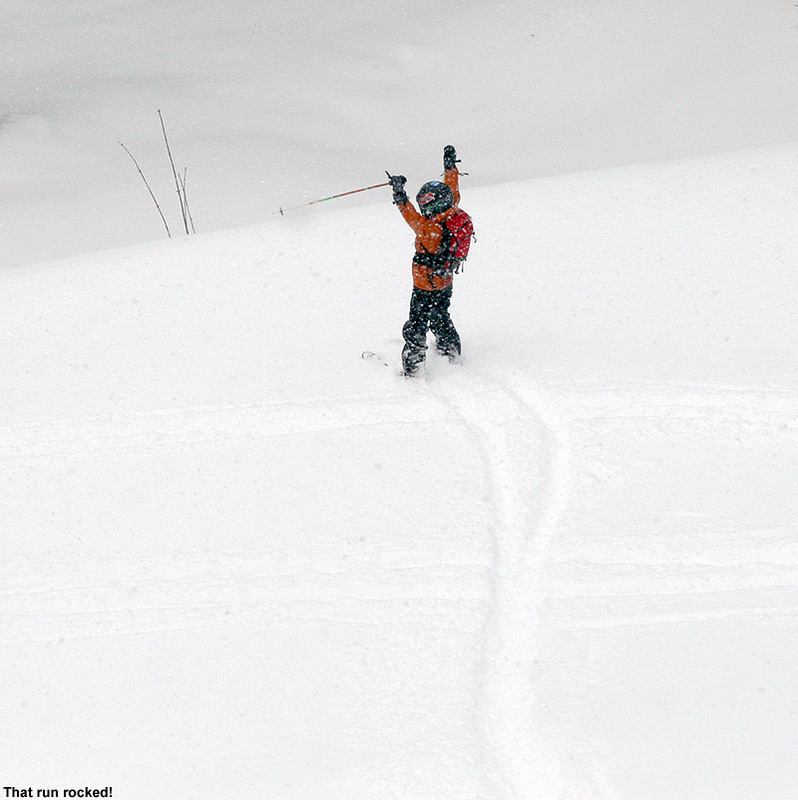 It was a test to see just how good the powder skiing was going to be, and it was a perfect introduction. The pitch in there is somewhere in the light blue range, which was just right for the 6 to 8 inches of settled powder lying on the ground. There hadn’t been a single track in there before we entered, but after everyone in the group dove in after us to try their hand at the powder, it looked quite different. The whoops and shouts as people passed through made it pretty clear that we were going to have a lot of fun finding more of that terrain throughout the day. That section of trees has a tight exit, and you could certainly tell the more veteran tree skiers from those that were still learning the ropes, but everyone eventually made it out successfully. Farther below, on the open terrain above Meadows, we found very good chopped up powder with some fresh snow thrown in by the winds, so that was also encouraging with regard to overall conditions. With Claire, Joe and Ethan, Ken and his family, and some additional family and friends of Ken’s,, our group numbered 16 as we headed over to Mt. Mansfield. There was no way we were going to hold that large a posse together, but we set our meeting point as the bottom of the Fourrunner Quad and knew that we’d all get there. The trip down Cliff Trail was OK, even if it felt a bit cramped with such a large group, but conditions really became icy once we got to Nosedive. I’m not sure if it’s the manmade snow or the traffic levels there, but if we hadn’t already been set on our course toward better snow, that experience would have done it. The highlight of that run was discovering the Liftline Trees that brought us all the way from Midway down to almost the base. 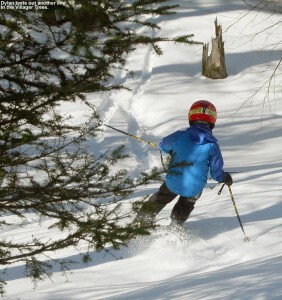 I can’t believe how open those trees are, or that we haven’t been skiing them all season. 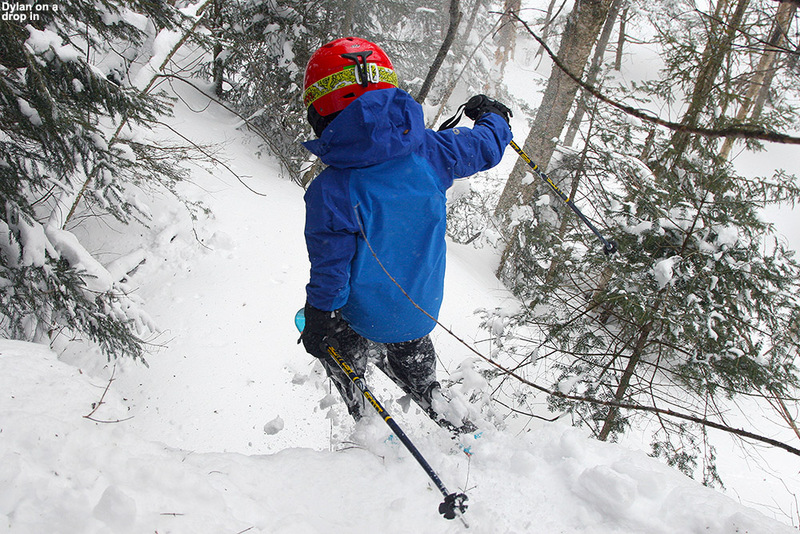 They are going way up on our hit list as an alternative to skiing Lower Liftline. We hopped on the Fourrunner Quad, and at the summit I showed the group the top of the Bruce Trail since we’re contemplating a sidecountry trip in that area next week if conditions cooperate. We proceeded toward Ridge View and Sunrise, and I showed the group some of the Sunrise Trees above Toll Road. The powder was really good in there, especially as we worked our way over toward some of the less tracked areas. 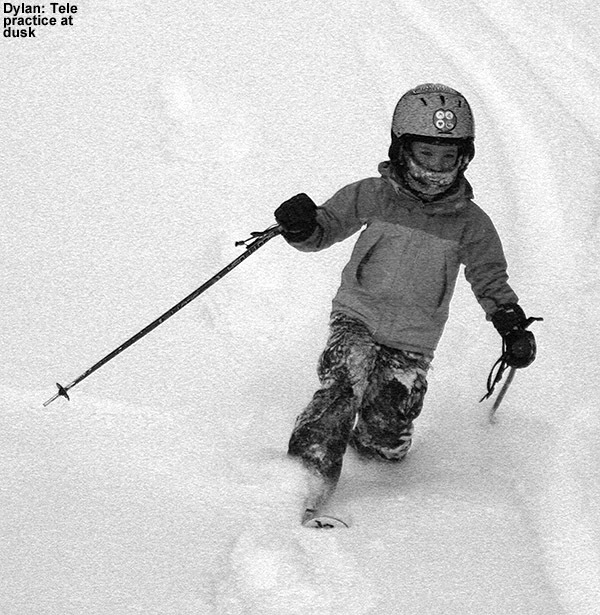 Dylan and I found lines with 8-12” inches of accumulation in there as we worked our way farthest to the skier’s right for a pit stop, and the turns were very impressive. 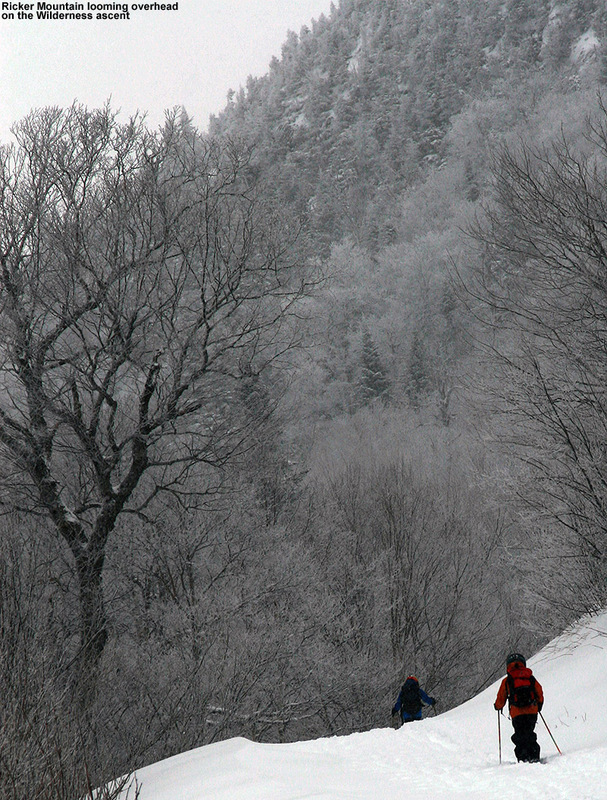 Below Toll Road we all dropped into the Chapel Glades and, they delivered just the kind of skiing that I’d expected. 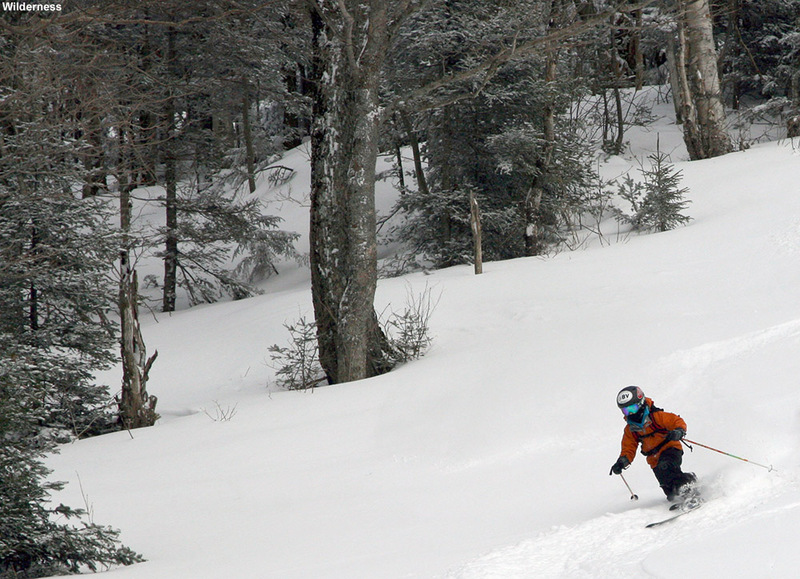 The main lines were fairly tracked, which is not surprising since they are an official glade on the map, but just a little venturing off to the sides revealed lots of untracked lines with a consistent 6-8” of powder. The pitches were just perfect for the snow we had. We regrouped at the Chapel, and as we passed along some of the Toll Road trees, we ogled the acres and acres of untracked snow that sat below us. We decided that we’d do another lap on the Mountain Triple, and we set our sights on a big run all the way down to the Toll House. As a bonus, we caught a lap through the half pipe and the terrain features on Standard – although a great part for some of us was the powder off to the sides more than the terrain features. 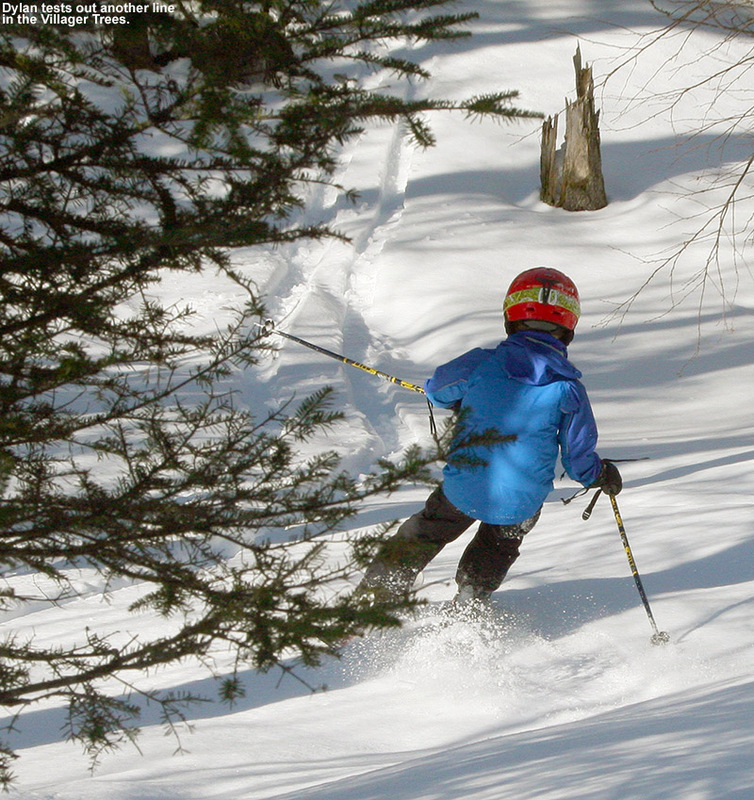 Joe was having a blast with the skiing, and he commented on how he was quickly gaining confidence and an understanding of what was possible among the trees. 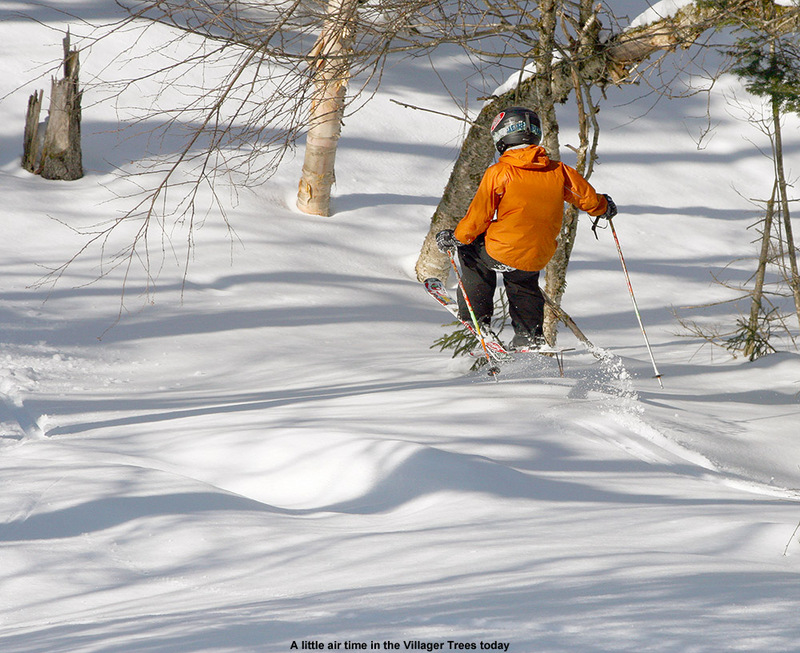 It really is an eye opening experience for skiers that get past that tree skiing threshold, because they start to appreciate that they’ve got thousands of acres between the in bounds and sidecountry terrain of Mt. 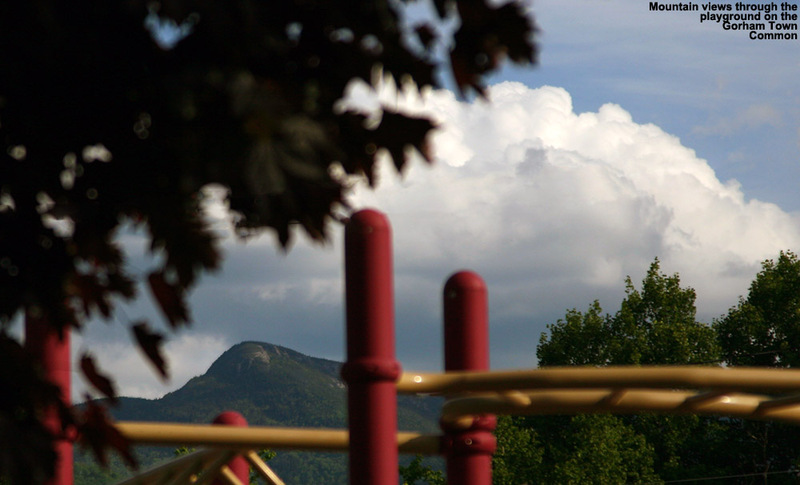 Mansfield and Spruce Peak. I started pointing out lines to Joe and Claire on our next lift ride, and it seemed like everywhere we looked, large expanses of open tree skiing terrain were just sitting there. Even though base depths haven’t really gone up too substantially over this past week, it’s as if a switch was flipped and lines hit some sort of threshold. That warming and base consolidation must have locked up some obstacles the previously might have been lurking in the soft snow. We’d temporarily lost Ken and his family, but with a bit of cell phone help we managed to get back together for our next run. We traveled farther along Toll Road before dropping into the Chapel Glades, and I regained a perspective on just how large that complex of glades actually is. This time, we continued down into the Toll House Woods, and really got a long run through the powder. It’s over a mile down to the Toll House, and we couldn’t ski the woods the whole way, but I bet we were in there for close to half of it, with the Tollhouse trail also got us some great fresh snow. When folks asked me why nobody ever skied down there, I said it was because of the long, slow return back to the rest of the resort, but on days like this when the conditions fit the terrain just right, it’s certainly worth it. 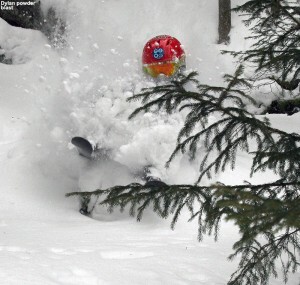 After our long trip on the Toll House Lift, we collectively decided to call it a day, but a few of us hit one more glade in the Lullaby Lane Trees, and that was a fun discovery. 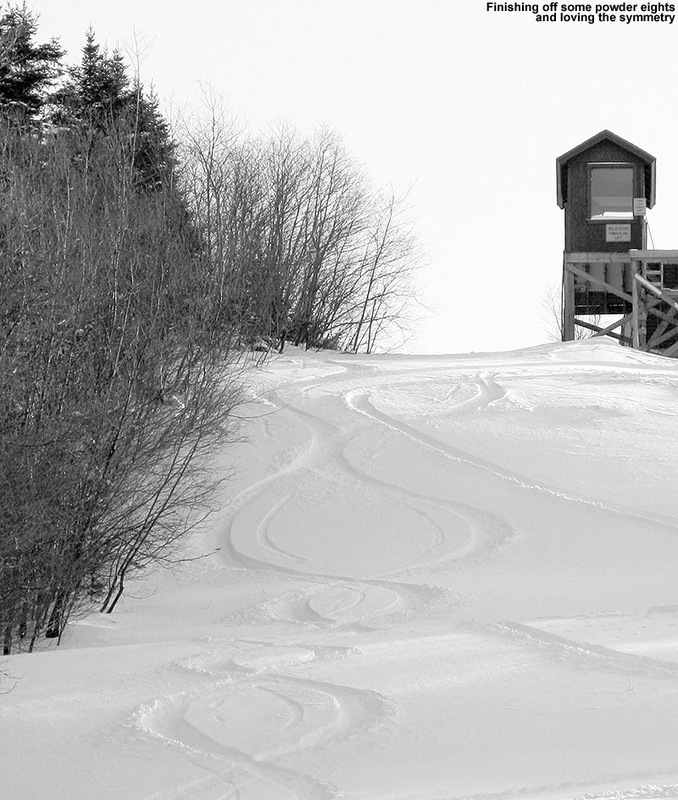 This was definitely one of those days where you really start to gain an appreciation for the vastness and seemingly limitless ski options available at Stowe. Despite years of skiing there, I just keep finding entirely new areas to ski. E and the boys and I went to the Whip for dinner on the way home, and met up with Claire and Luke in the dining room. The Whip is one of our favorite places because they’re open all day, and you can get great food there while other places are in between lunch and dinner. So if you have an early ski day at Stowe and finish in the mid afternoon, you can stop in at The Whip and get a great meal. It’s going to be interesting to see how things work out next weekend in terms of conditions, because we could be in for quite a snowy week if the forecast is correct. Since we had some warm weather at the beginning of the week that brought all elevations above freezing, and a return to more wintry temperatures by midweek, I wasn’t even sure that we were going to ski today. The snow surfaces were simply going to be hard, the only way around that would be fresh snow, and there were no notable storms in the forecast. Because the weather pattern has been relatively prosaic over the past month or so, there hasn’t really been much of need for refresher storms, but they were definitely needed this week. 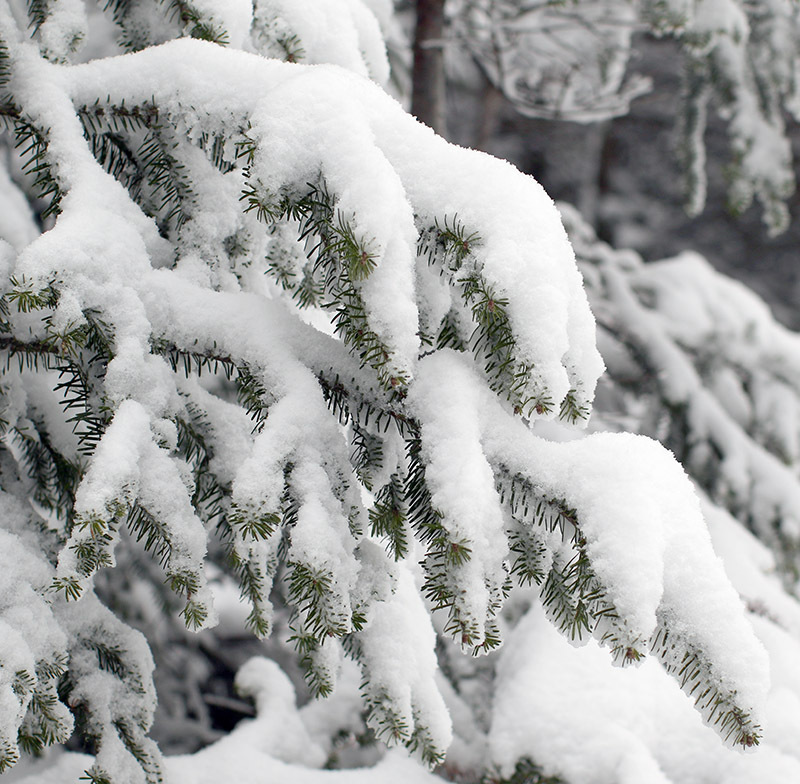 The only winter weather events in the forecast were a couple of small, upper level low pressure systems that were expected to pass through the area. Each one looked like it would be a 1-3” type of event, which would hardly be enough to get past “dust on crust” conditions. The Green Mountains came through though, working their magic to pull out up to 10” of snow from the first event, and another 6” from the second in the north central areas. Even areas father north that didn’t jackpot with those two storms were well on their way to some nice conditions. 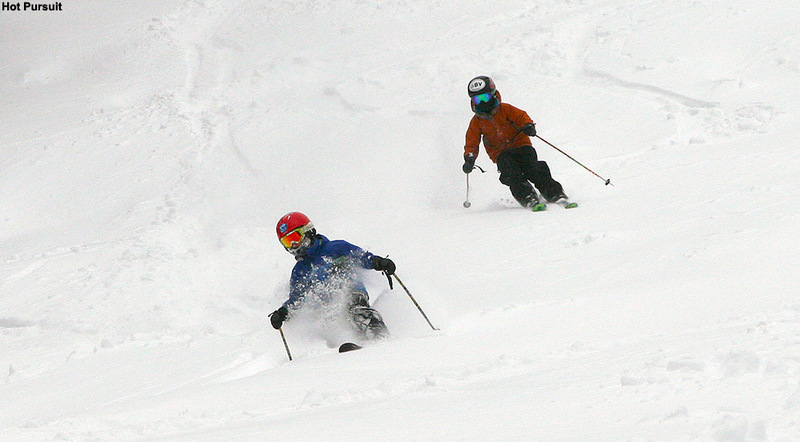 With the storms delivering, it was time to make a plan for some Saturday turns at Bolton Valley. I expected that the 7” they’re reported in the past couple of days was a bit conservative, but with the new snow being split between Thursday and Friday, the best turns were going to be found on terrain that hadn’t been touched at all. 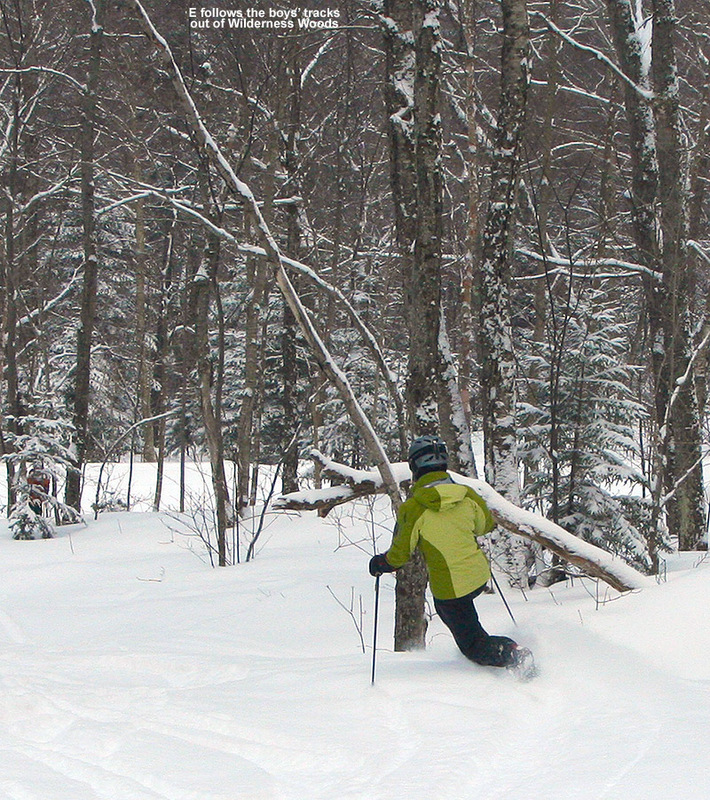 I decided that some moderate angle terrain on the backcountry network would be the way to go, and it seemed that one of the glades we’ve been skiing the past couple of weeks would fit the bill nicely. With some sidecountry laps off the Wilderness Lift, we could get good access there. 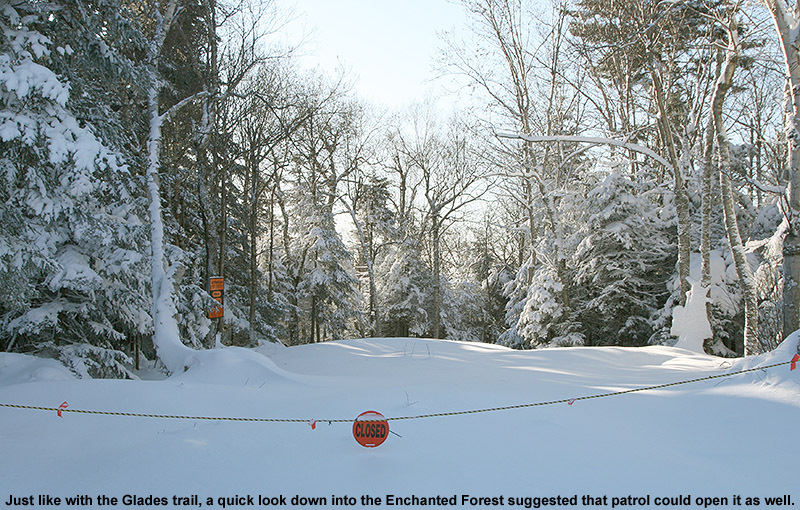 That plan actually went by the wayside when I saw that the Wilderness Lift wasn’t running, but of course that opened up a whole new realm of untracked terrain in the Wilderness area itself, and we could certainly make use of that. E was dead set that she wanted to do a bunch of cleaning in the house today, so I couldn’t convince her to head out for turns, but she did insist that I get the boys out of the way. No problem. The three of us packed our bags with skins and snacks, and headed up to the mountain in the late morning. Temperatures had been hanging in the low 20s F all morning in the valleys, and even colder in the higher elevations, so we knew that powder would be staying light and dry. The on and off sun that we’d had in the lower elevations much of the morning was quickly replaced by light snowfall as we hit the 1,000’ elevation mark on the Bolton Valley Access Road – the mountains just didn’t seem to want to let go of that moisture. 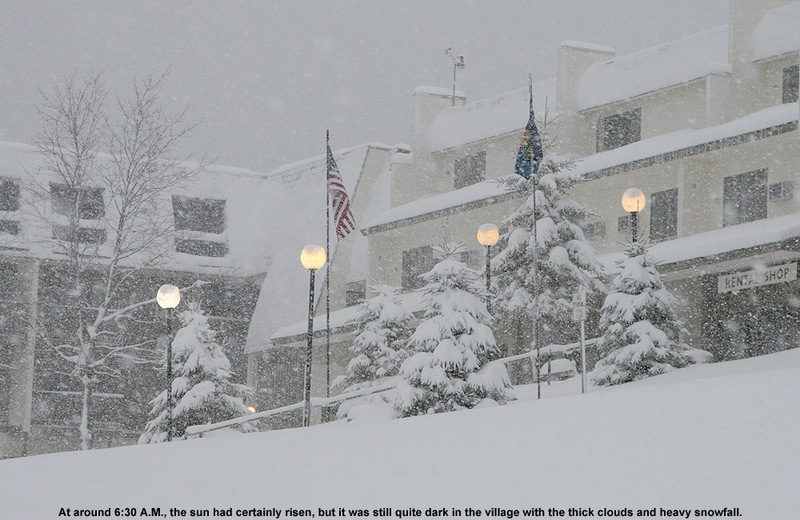 The resort looked like it was doing a brisk business, with the fourth tier of parking in the Village lots just about full. I chatted with the parking attendants about potential spots higher up from people that had already left, and ended up getting a good parking location right along the south edge of the lot. 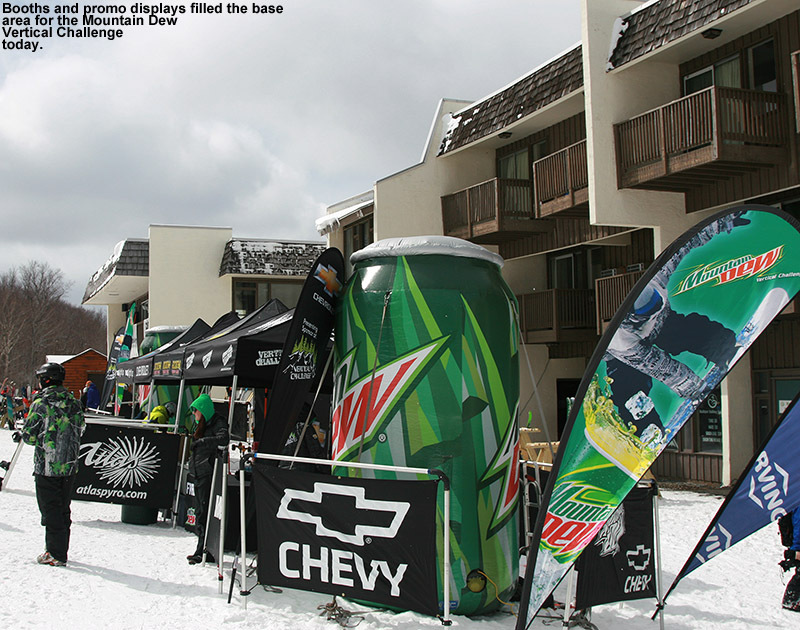 There was lots of activity at the main base area as we boarded the Vista Quad, because the Mountain Dew Vertical Challenge was taking place. It would have been fun to hang out and join some of the festivities, but there was powder to be skied. 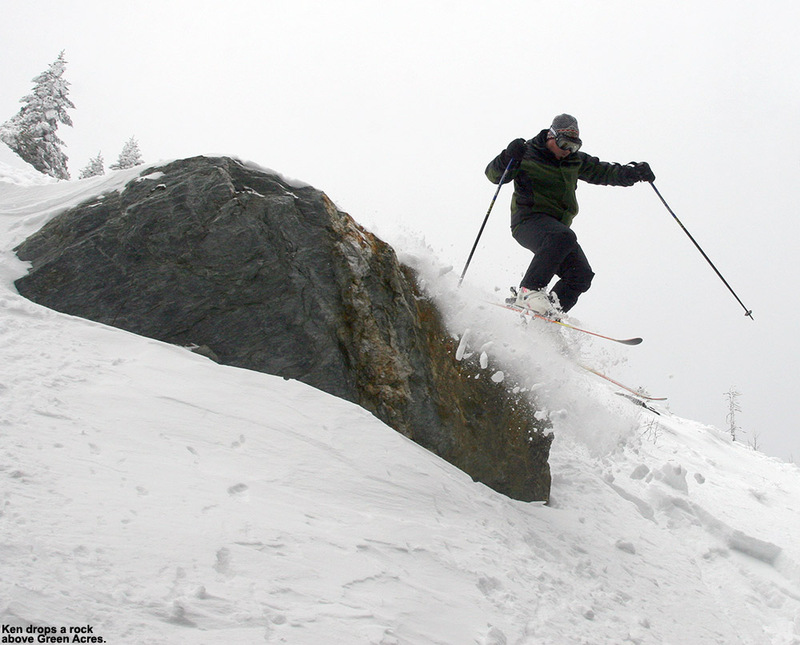 Our first test of the day’s conditions was Alta Vista, and indeed one could see that surfaces were much firmer than last weekend. 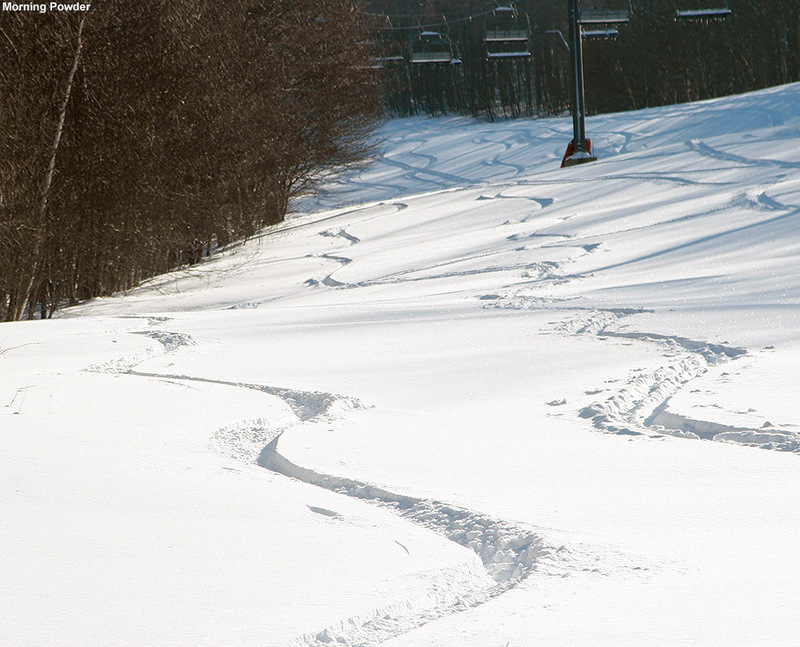 The grooming had definitely tilled the new snow into the base, but traffic had also made its mark on the terrain. I’d hit some areas of excellent packed powder where my skis could bite soft and deep, but plenty of others where it was quite firm, and at 115 underfoot, the fat skis certainly weren’t the tool for the job there. 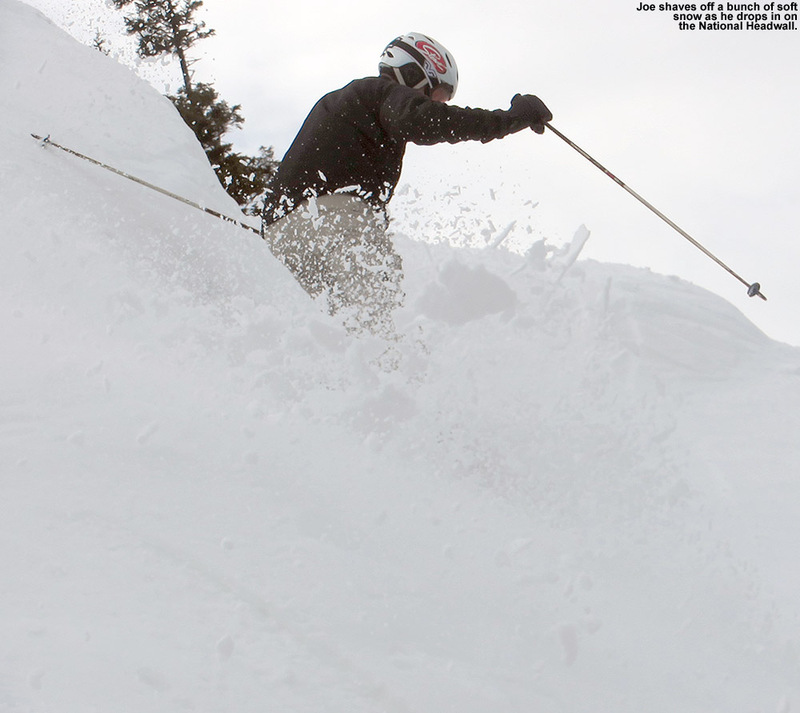 The skier’s left offered up its usual supply of powder, but it wasn’t quite the effortless, soft flow that it sometimes is; the powder hadn’t quite hit that threshold depth to really let you crank hard in there while totally avoiding the old base snow. At the base of Upper Crossover, we began strapping on the skins to head upward. Josh, who had found time for a break from his day’s duties, was out taking a run and spotted us in preparation for the ascent. We chatted for a bit about the festivities going on with the Mountain Dew Vertical Challenge, and he brought up the fact that part of the event was a race. I think they boys might have fun with that, so we’ll have to keep our eyes peeled if they do it again next season. We bid Josh adieu as he continued with his run, and we finished preparing for our ascent. I finished with Dylan’s skins first, and let him go to get a head start, then followed up with Ty and let him go. They’re definitely becoming faster ascenders, but I knew I’d be able to catch them pretty quickly. 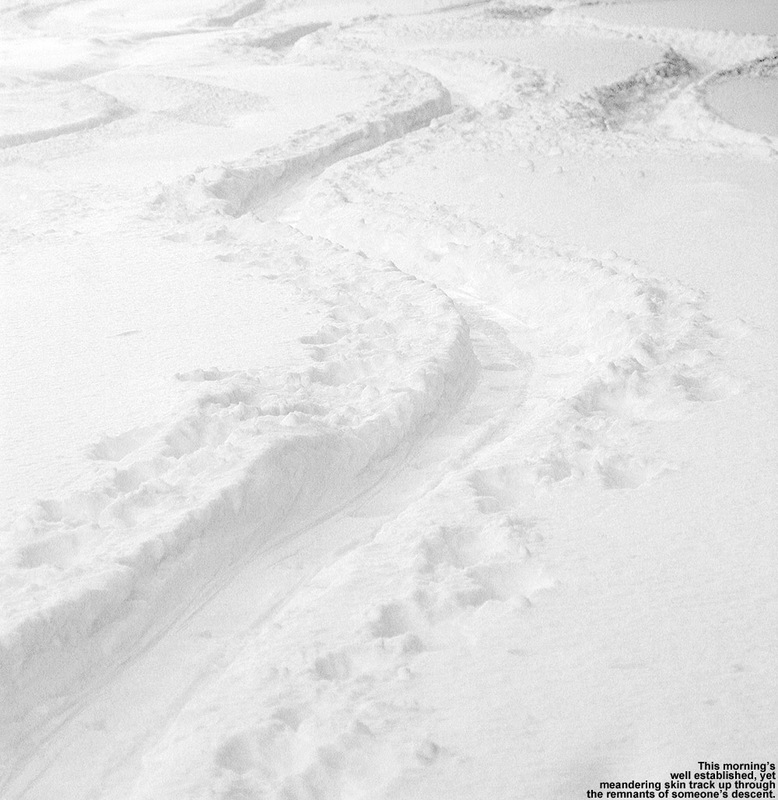 We found that there was a skin track in place, but it looked like only one other person had used it at that point, and that bode well for encountering lots of untracked terrain. 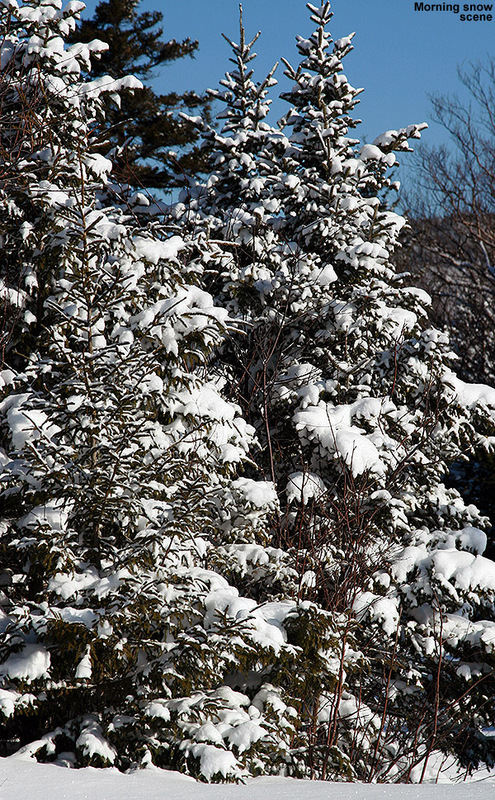 The weather was just perfect – wintry and moderately cold, with no wind. I did numerous depth checks on the powder up there in the 3,000’ range, and was getting readings from 6 to 9 inches in areas that didn’t have drifting. 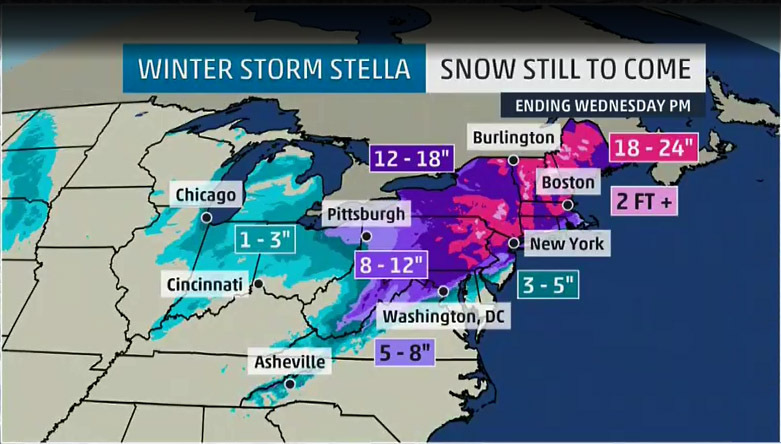 That’s after some settling over the past couple of days, but the 7 inches reported for the past two events certainly seems to be in the ballpark. The crux of the ascent was actually right at the top of Bolton Outlaw. New snow hadn’t settled in well there, and previous scouring left a lot of ice. We really had to work our edges and do some side stepping and pole work to pass through that area. Dylan muscled his way through a challenging slick spot that Ty and I staunchly avoided, and it was quite impressive to see him stick it out. 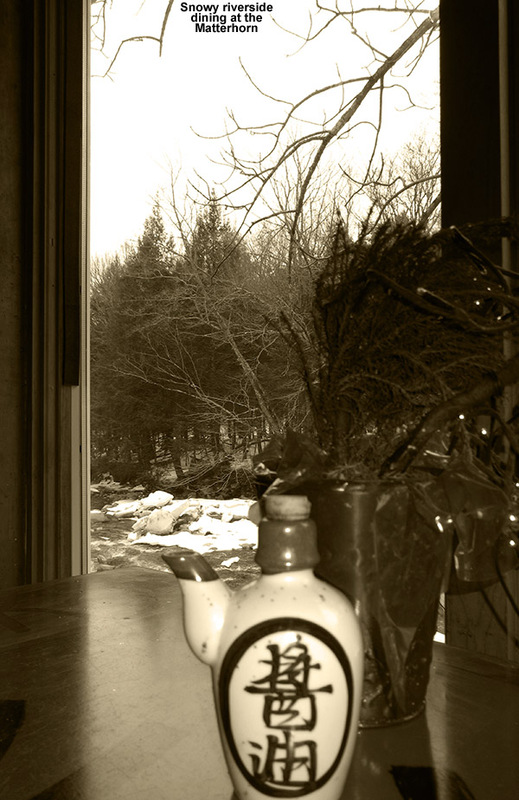 The boys recharged with some GU at the Wilderness Summit, and then we headed in the direction of Peggy Dow’s. 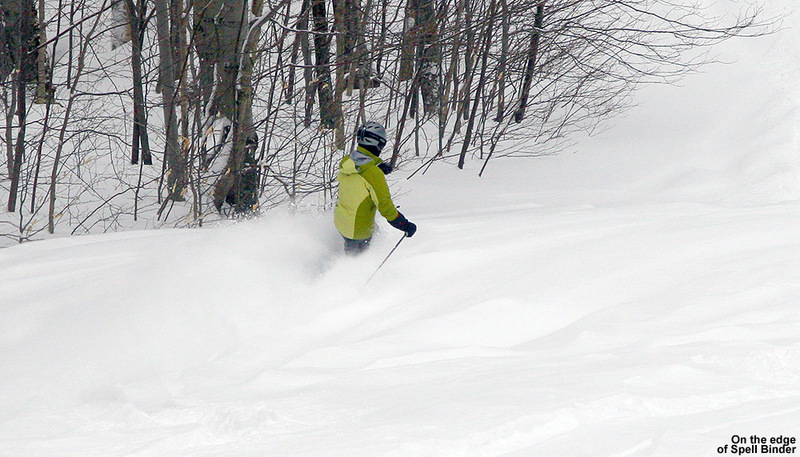 The descent featured some great snow, with generally that 6+ inches of untracked powder unless the wind had played around with it. 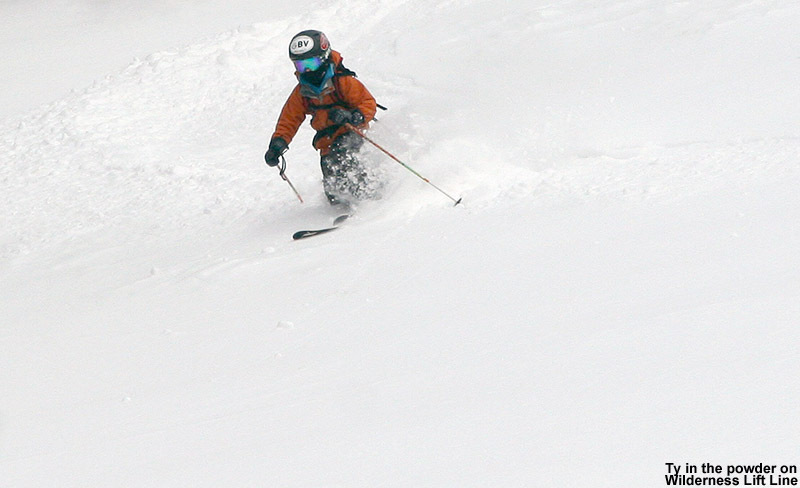 The best part of the descent was that the boys had plenty of time to work on their Telemark turns in powder, which is something they only get to do so often because they’re typically using their alpine equipment. 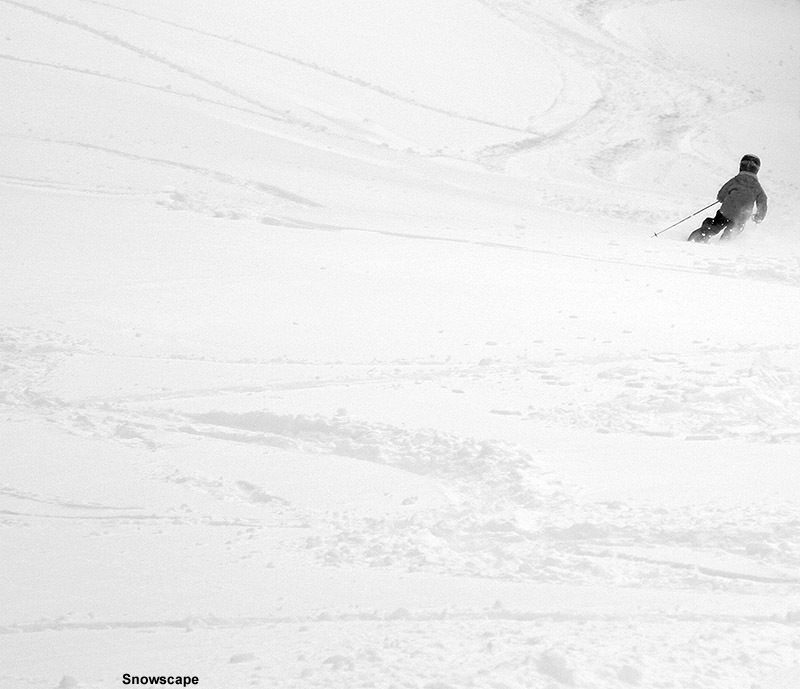 Today, with the quality of the snow and the very even subsurface, they were really making strides on those turns. 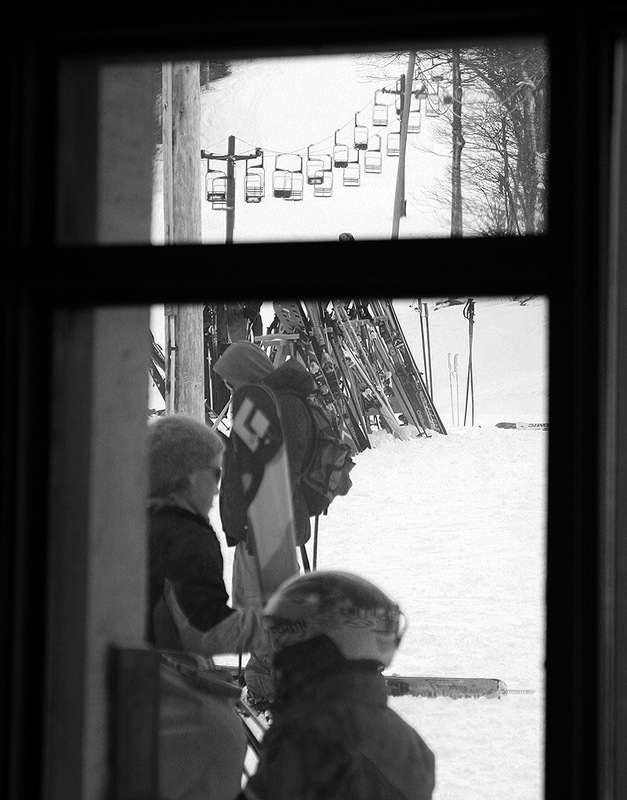 Time and time again I’d hear them hooting about how they’d just made “their best powder Telemark turn ever”. Naturally the powder skiing wasn’t 100% bottomless everywhere, but you could definitely get a good percentage of bottomless turns on most pitches. Since we’d all pulled out the fat skis to help in that regard, we were enjoying the fact that they were clearly doing their part to keep us off the subsurface. Lower Turnpike was mostly groomed and had seen a little traffic coming over from Vista, but the edges held a lot of untracked snow, and powder turns were plentiful for essentially the entire descent. It wasn’t going to be too hard to get the boys to do another lap if it seemed like that was the way to go. Ty was raring to go again, but Dylan was calling for lunch after that lap, and the choice was made to head up to Fireside Flatbread. The upstairs of the base lodge was full of people taking part in the various festivities of the day, so we sat at the bar and had our slices while we soaked up the scene. My pizza was a fun combination of vodka sauce, broccoli, sun dried tomatoes, and red onions, and Ty and I joked about how my slice was almost half of a large pizza. That was Ty’s estimate, and I’d say it was more like 1/3 of a pizza, but it was a monster. 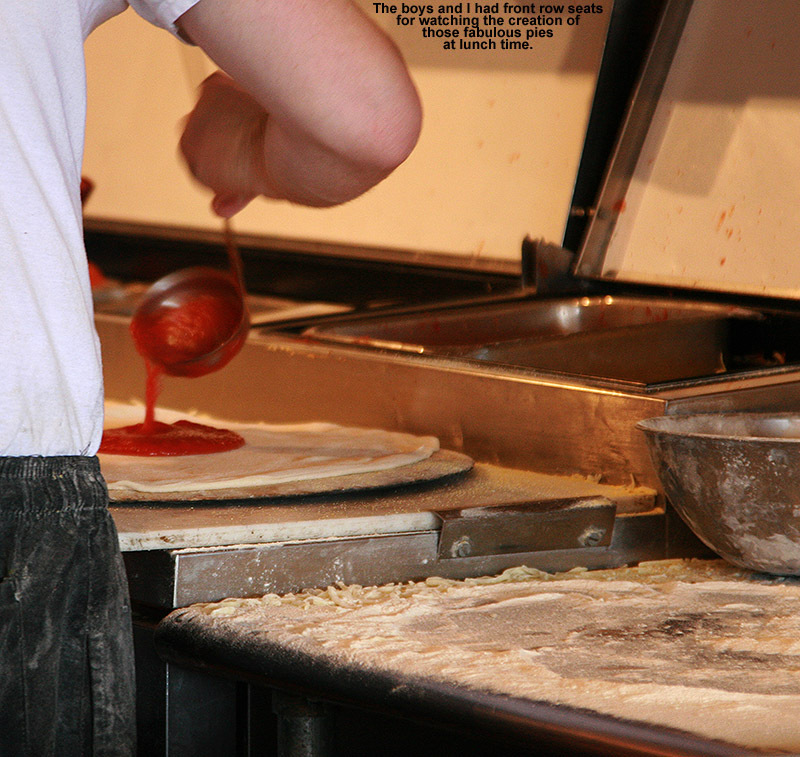 We enjoyed watching the pizza guys doing their quick and masterful assemblies of various pies. I overheard them talking with one of the managers about the potential Fireside Flatbread schedule midweek next week, discussing the options for what they’d do it if dumps. There’s the potential for a significant synoptic storm in the Tuesday timeframe, and that’s something we really haven’t seen much of in Northern Vermont so far this season. We’ll be watching the forecast with anticipation just like them. After lunch we hit the lower half of Wilderness and worked our way over to Snow Hole. 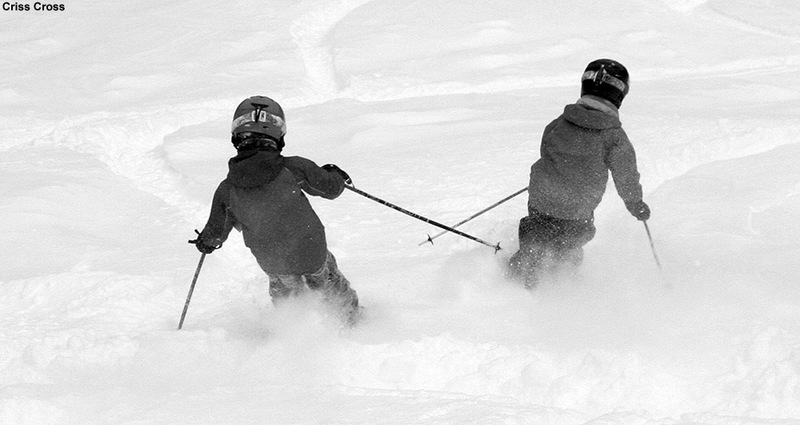 The boys had already asked about it on their first run, and it seemed like a great idea. 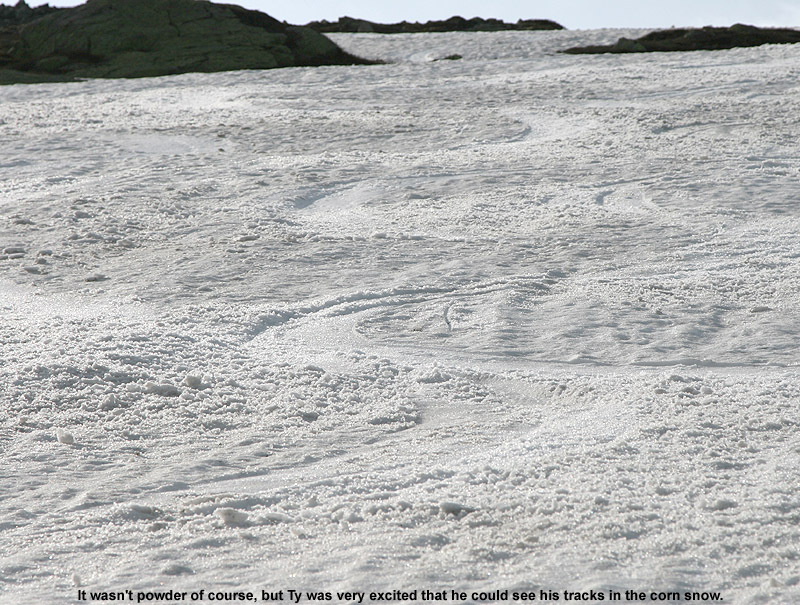 The snow was quite good in there, with just a couple of other tracks. The light snowfall that had been with us during the morning had tapered off after a couple of hours, but clouds were generally around and the snow was still staying wintry all the way down to the Village. We also did a run on Snowflake to work in some of the powder on Snowflake Bentley, and it really was still sitting there along the edges even as we were moving past mid afternoon. 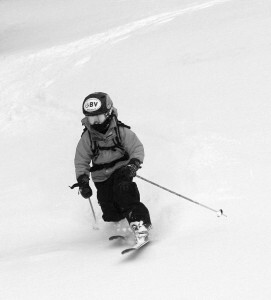 The boys worked in some additional excellent Telemark turns on those pitches. Conditions really only get marked down today because of the subsurface that is firmer than usual due to the warmth, and some spots being closed because coverage was a bit thin, but if this next storm is substantial enough, those issues could be remedied quite well. Today’s weather was a lot like yesterday’s – the morning started out quite cold, but bright March sunshine quickly brought temperatures well up into the 40s F even in the mountains. 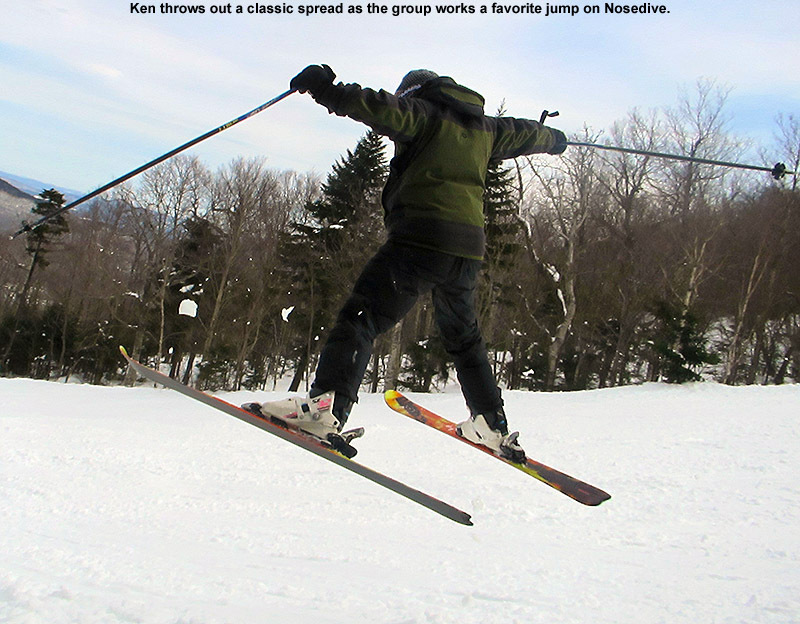 We were back at Stowe for our BJAMS ski program today, and people seemed really excited to get right out and taste the skiing on soft snow under sunny skies. 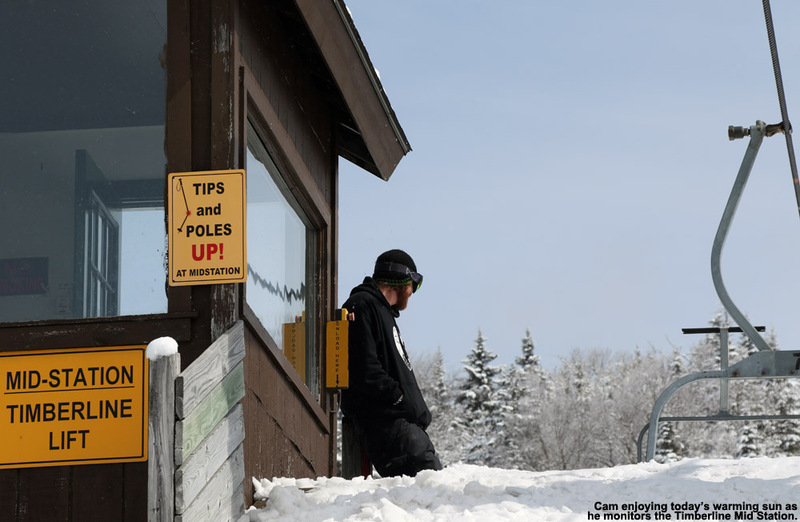 With no notable snowstorms affecting Northern Vermont over the past week, base depths have stagnated and the snowpack at the stake remains at 64 inches. That’s within an inch of where it was a week ago at this time, and while the dearth of storms is keeping the snowpack below average, it’s still deep enough for ample base on just about every slope. Today we joined up with Joe’s group to form a large aggregate of 11 skiers, and our first goal was to get Ken out for a run on Angel Food. 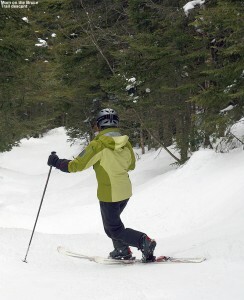 We’re approaching the time of year when people start to switch up their ski clothing to accommodate the warmer temperatures, and there’s always the danger of leaving your season’s pass in an article of clothing that you’re not wearing. 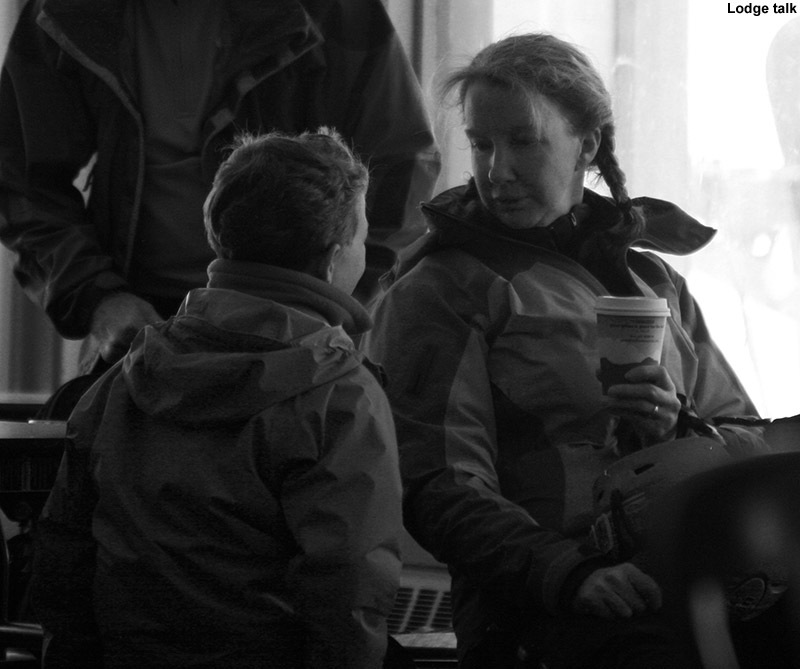 Indeed that’s exactly what happened to Luke today – as he got in line for the Gondola he realized that his pass was in his other jacket. While he headed back over to Spruce to grab it, the rest of us decided to put Angel Food plans on hold for a run on Gondolier, allowing us to quickly meet him back at the bottom. 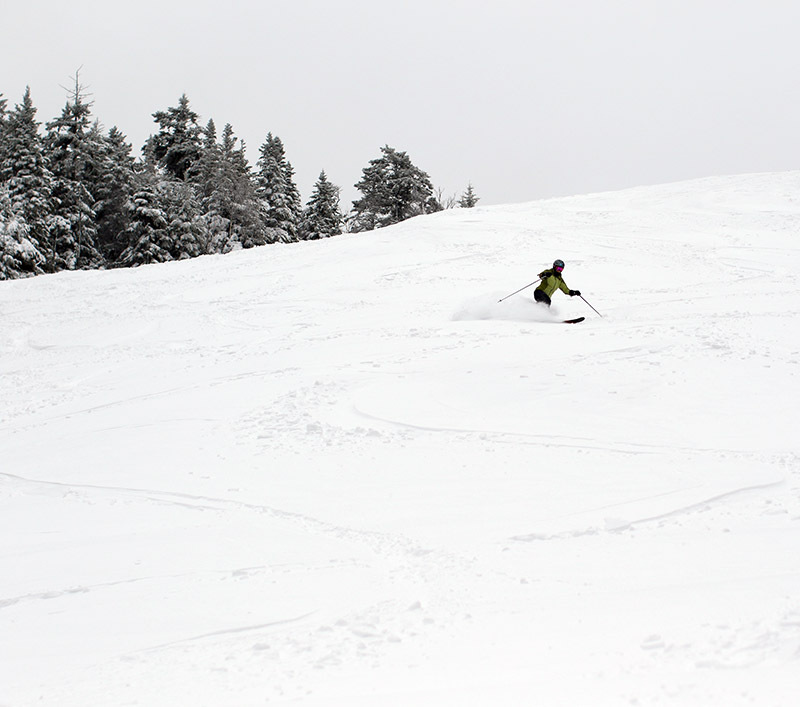 I’d say this change in plans was probably for the best, because the early afternoon sun was creating some sticky snow, and it was best to go for areas with skier traffic for a firmer surface. 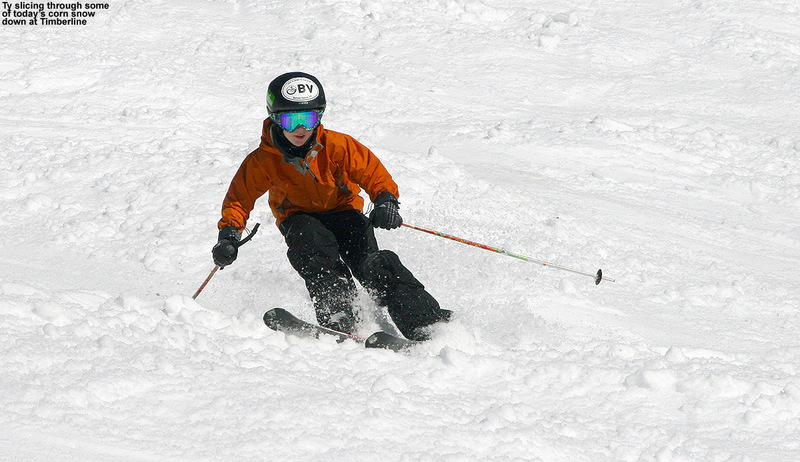 The snow was beautifully pliable and soft, and certainly not overly slushy on the groomed runs, but you would still encounter some stickiness. Off piste areas without any traffic indeed had mushy snow, and not knowing the traffic levels out at Angel Food, we decided it was best to hold off until surfaces were either fully converted to corn, or we got back into some winter snow. 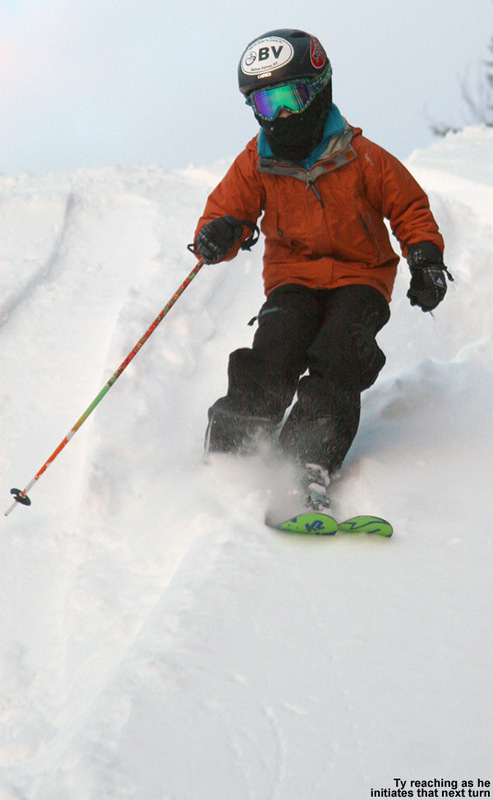 With the new assessment of snow conditions, we decided to head over to ski some terrain off the Fourrunner Quad. Slopes with snowmaking often have that denser snow that provides a bit of resistance to that stickiness, so we headed over on Cliff Trail to check out Nosedive. Lower Nosedive was OK, but even with its manmade snow it really didn’t offer that much of a difference from what we’d experienced on the natural snow terrain, so while checking out Upper Nosedive was on our list, we were certainly open to other options. 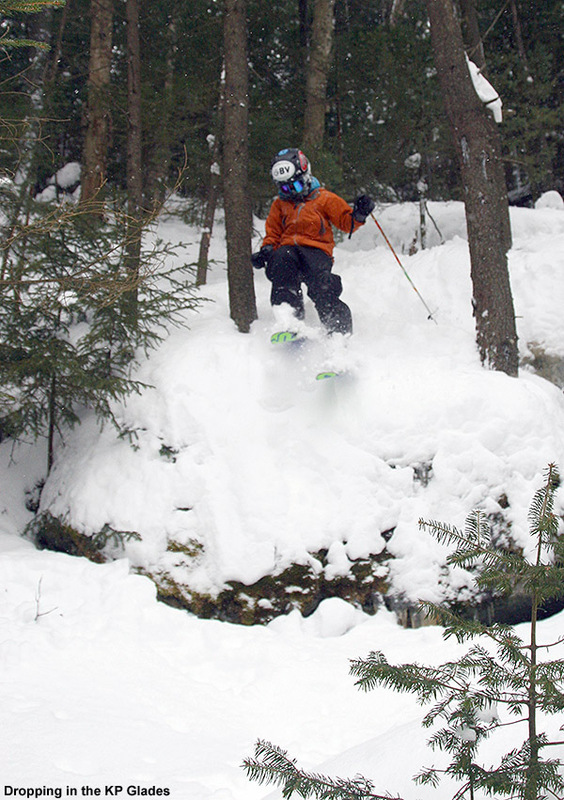 A definite highlight of Nosedive was that due to the soft snow, every little terrain feature and jump is getting that extra bit of sculpting, and the kids were chomping at the bit to hit one of their favorite kickers at the Nosedive/Cliff Trail intersection. Soft snow for landings meant that going a bit bigger was the call, and even the adults joined in and threw out some air of their own, including a classic spread from Ken. As we remained on the lookout for other trail options, some quickly presented themselves as we made our next ascent on the Quad and looked down at Liftline and National. 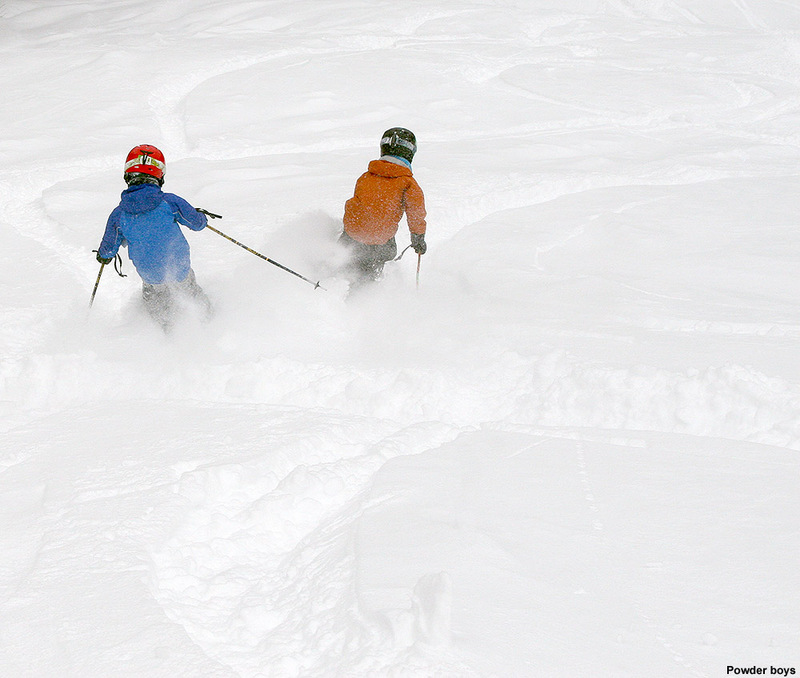 They looked like they were in prime form, the skiers we saw seemed to be having a blast, and we know that this was the perfect kind of snow for skiing them. Ken shows the kids how it’s done on Nosedive today. We quickly changed our plans to a descent of National – the top of that National Headwall is very steep, and this was the perfect time for the students to practice those steep turns without any ice. We found the headwall in nearly perfect form – although the surface wasn’t quite corn, it was a beautiful, soft concoction of softened snow that just peeled away as you dropped in, and the high elevation and steep aspect meant that the sun wasn’t provoking any sticky melting in the snow. A lot of positive vibes came out of the descent of the headwall, as some initial trepidation dissolved when people realized that dropping into something so steep was well within their means, and that it wasn’t only manageable but downright fun. Luke T was extremely impressed with how well he skied his entry, and he looked great as he cut well controlled turns down the steep face. 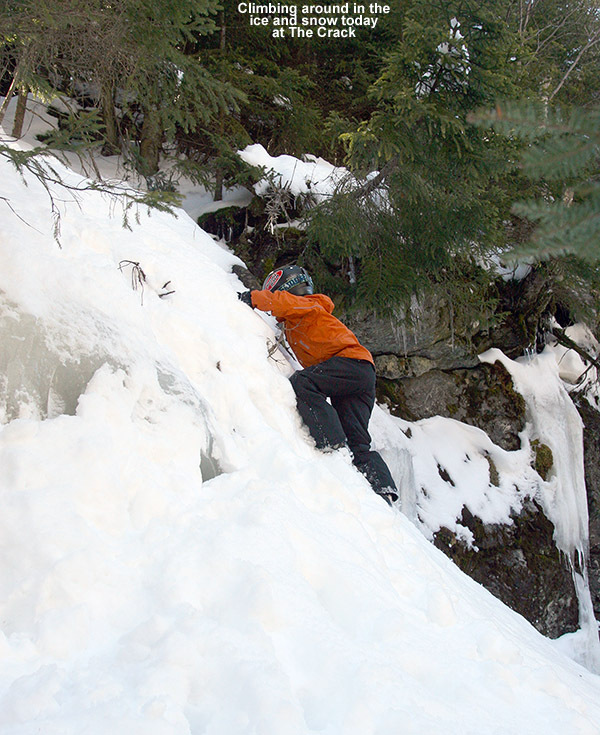 Joe was immediately calling for another go at the headwall because he’d had so much fun. Below the headwall sat the never ending land of steep bump lines, and I think everyone got a workout and then some as we worked out way down Liftline. While Ken worked with Joanna on some of the finer points of tackling that sort of terrain, the rest of the gang gathered farther down the trail… and naturally a snowball fight broke out. 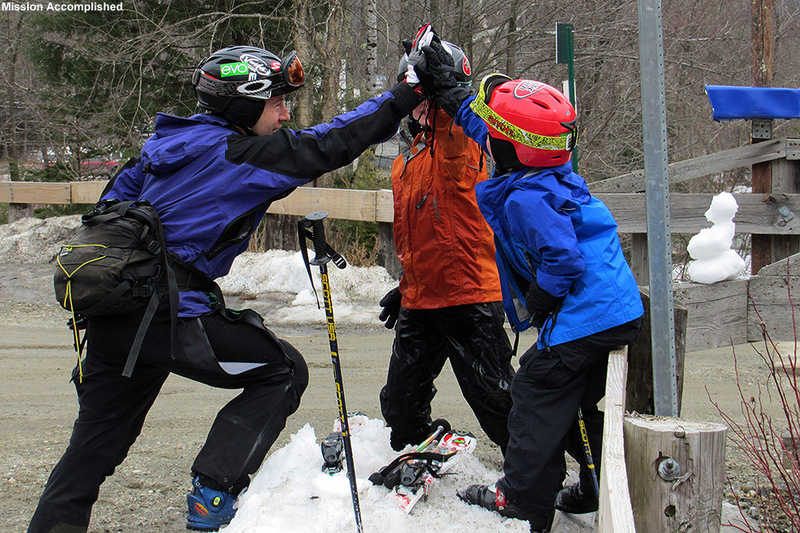 Ty wanted to ski the same run again, just so that we could have another snowball fight, but the general consensus was that the headwall was just so much fun that we had to do it again. On the second lap I shot some pictures of people dropping into the headwall, and managed some decent ones even though I only had E’s Canon PowerShot ELPH 510 HS point and shoot on me. It’s got a decent high speed burst mode capturing 3 megapixel images at ~8 FPS, but it locks the focus on the first image and you can’t really zoom while shooting, so there are certainly some limitations relative to using a DSLR. But, it gets some good pictures in a pinch. To mix things up we continued on down to Lower National instead of Liftline, and I’d say everyone’s legs were getting pretty cooked by the end of that one. We finished off the day with some Lord Trees and a run on Hackett’s Highway, which the boys have really been enjoying lately. 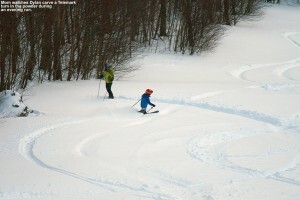 Coverage is still great there, which speaks well about the natural snow depths, even on the lower half of the mountain. The cliff bands have got some patchy spots with poor coverage, although that is somewhat typical even when the snow depths are above average. Clouds came in as the afternoon wore on, and those surfaces that had gotten a bit sticky actually sped up without the direct sun. It looks like we’ve got a couple more warn days coming up to start the week, but then we’ve got some midweek snow and winter temperatures for the foreseeable future. Hopefully we can get sufficient new snow this week to cover up the snow surfaces, because the return to winter temperatures will probably set them up firmly and they’ll be scratchy without some powder.